If you are one of the 8 percent of Americans (excluding New York and California, whose percentages are lower) who has a concealed carry permit, you have most likely wondered how you are going to carry your gun at some point. In some states, it needs to stay concealed as they don’t have open carry laws and any exposed weapon, however unintentional, can get the wearer in trouble. So, how do you carry your gun legally and safely? The old saying used to be something like “carrying a gun concealed is not supposed to be comfortable but comforting” or words to that effect, but with modern holsters, you can have both. It didn’t used to be that way. We have gone from the time when the only types of concealed carry holsters readily available were mostly belt-slide outside-the-waistband (OWB) leather holsters that had loops or slits that you slipped your belt through and then positioned it where you wanted it. 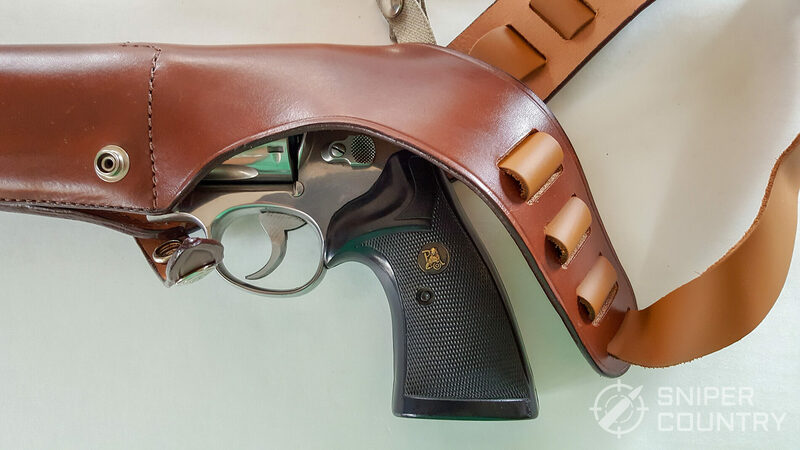 Also, the “pancake” style of holster (flat, with belt loops wide apart to help hold the gun tightly against your body) was very prominent in the 1970s. It still sells today, but it has more competition. Other types of concealed carry (CC) holsters from the bygone days included shoulder and ankle rigs. If there were any mainstream inside-the-waistband (IWB) holsters back then, I’m not aware of any; I could be wrong but I remember not having an option of carrying anything inside my belt line. I am only considering safe, real holsters. At the time revolvers were still pretty much in demand for CC. There were those semiauto aficionados who carried 1911s or a smaller caliber but (around here at least) they were in the minority. This was before the 9mm “revolution” and most semiautos were in .45 or .380, with not that many gun choices available. The S&W Chief’s Special (Model 36) or Colt Detective Special or Cobra were in vogue as carry guns and many cow hides were made into gun leather to carry them. 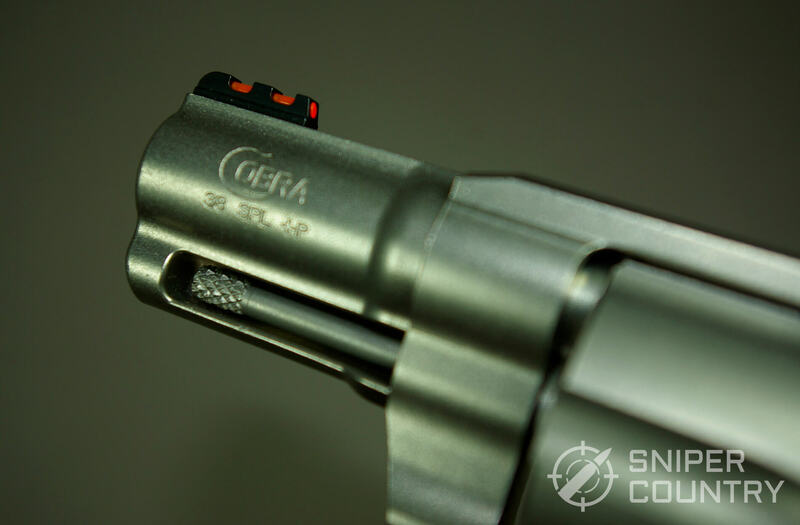 I had a Cobra- it was a great carry gun. Cut to the present…poly-framed striker-fired guns seem to rule the CC roost now and there are many other types of guns available to carry. We live in a golden age of guns made for concealed carry right now…your options are plentiful and varied. If you are a revolver fan, I say great – you have more gun choices now than ever before and more ways to carry them. The profusion of new guns and designs is not limited to semiautos. 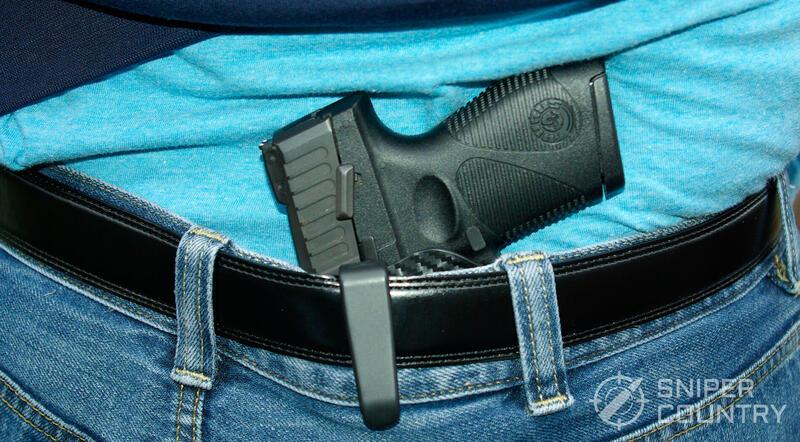 I do believe that the greatest benefit to a lot of us concealed carriers has been the rise of the inside-the-waistband (IWB) holster. 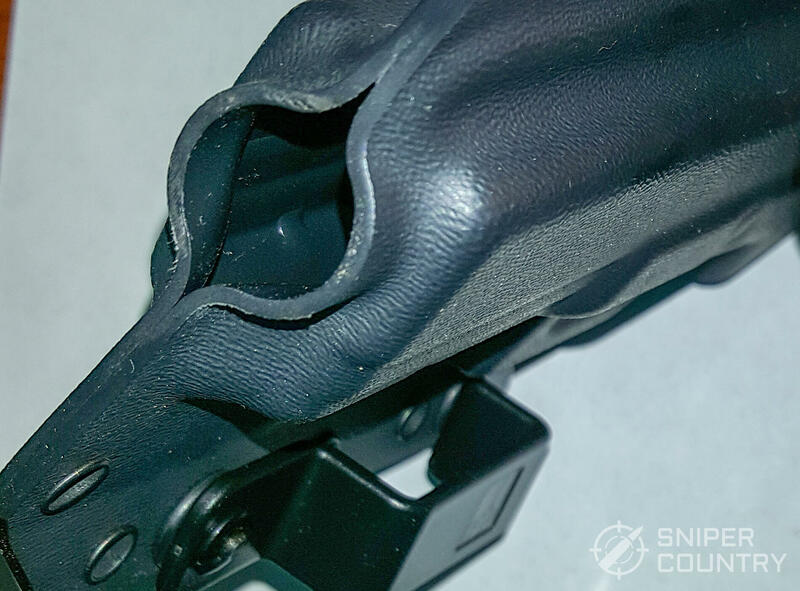 From inexpensive neoprene “sheaths” that will hold a gun (but not stay open to re-holster it) to state-of-the-art leather and kydex hybrid holsters, it is easier than ever to pack your gun without it being revealed yet still have fast access to it if needed. 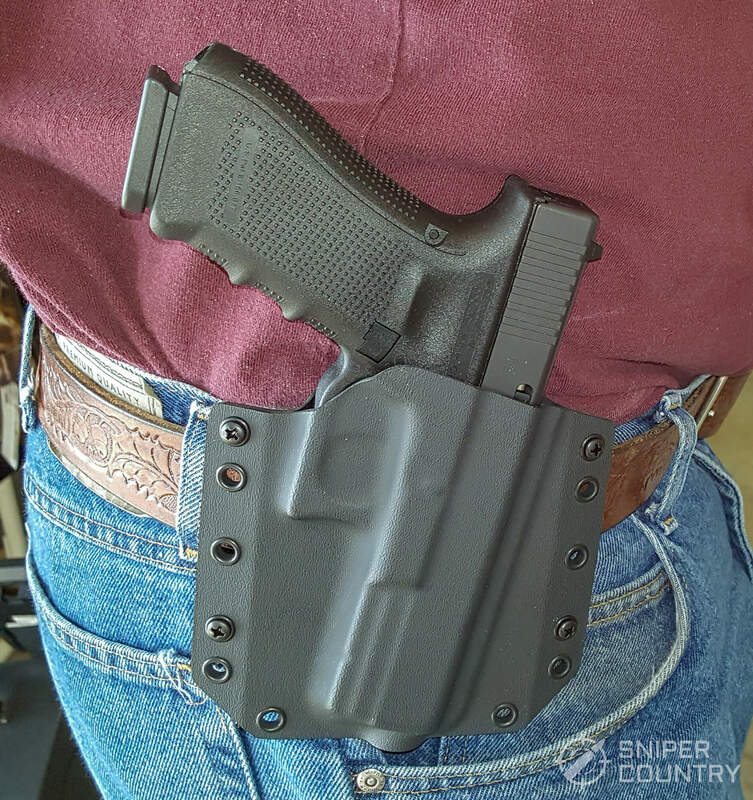 There are even what are “tuckable” holsters that allow you to tuck your shirt in over the holster clip, thereby offering even more concealment. The IWB holster works for all body types, but sometimes we have to be a bit creative. 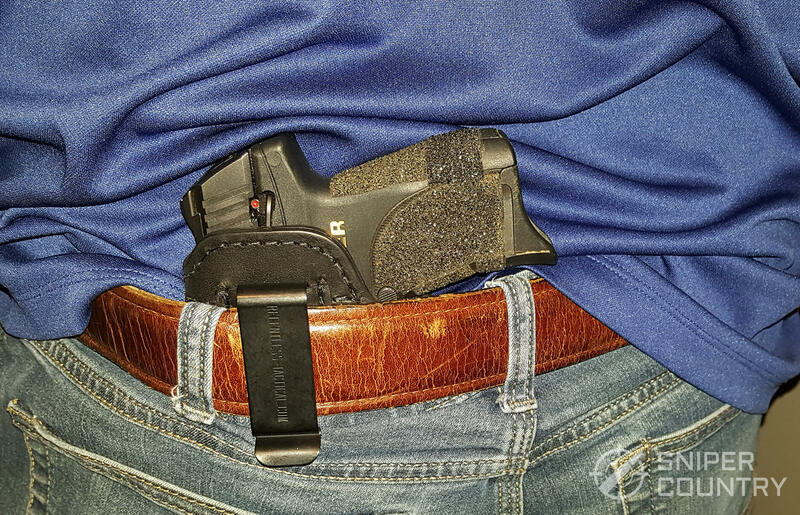 If you are what I call skinny (you can see your toes without bending over), the IWB carry position is a no-brainer due to your body type’s ability to hide a gun well at just about any IWB position you choose, including appendix carry. 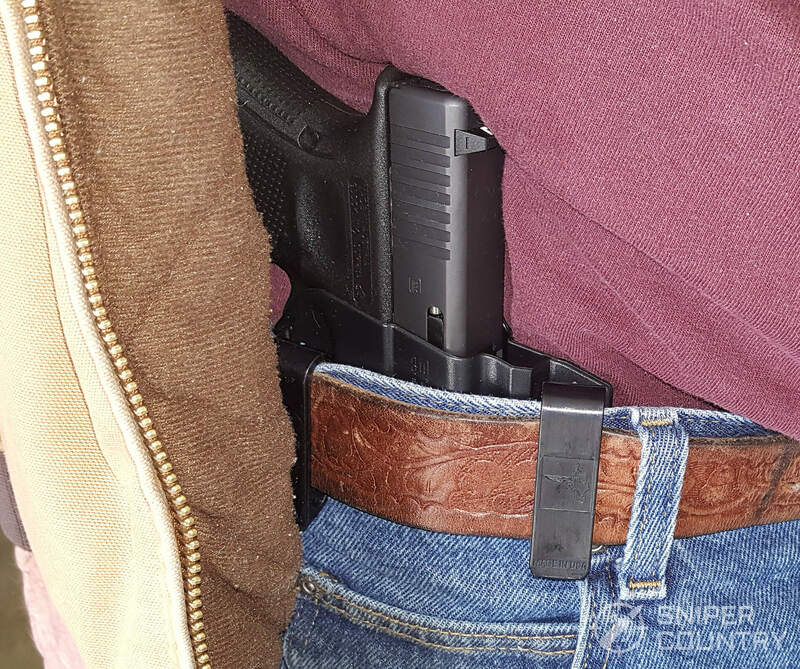 If, on the other hand, you are built like me (I just assume I have toes and let it go at that), you can still use an IWB holster – you just might want to wear pants a size larger in order to accommodate the holster. 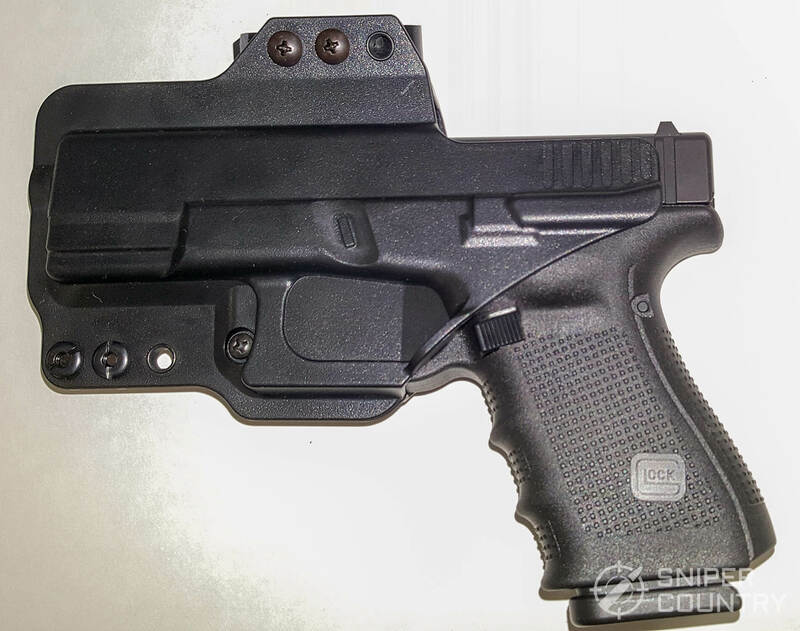 This size-larger thing is applicable to most IWB carriers, but it really applies if your waistband has all it can do to hold you in, let alone add a gun into the mix. You don’t want the holster or gun printing, plus comfort is important. If your rig is not digging at you all day, you’re more apt to wear it and as we all know, a small gun with you is better than the hand cannon in your nightstand gun safe. Before we look at individual holster types, we need to talk about holster retention. This is a term you will hear used a lot in relation to how a holster retains the gun it carries. It could range from just a friction fit to two or three levers, straps, etc. that you have to disable in order to draw the gun. Passive, where the gun is held mainly by friction and all the wearer has to do in order to draw the gun is to pull it out of the holster. Active, where there is some feature that has to be manipulated or disabled in order to draw the gun. Level One: A Level one holster has only passive retention. Friction (and any possible other “hold” factors built into the holster such as trigger guard molding) is all that keeps the pistol in it. Most concealed carry holsters are level one, since that’s all that is usually required. The gun should stay in the holster unless drawn by the wearer correctly. The Level One holster is by far the most popular choice for concealed carry. Level Two: A Level Two holster has one active retention device in addition to the Level One friction retention of the holster itself. This makes two sources of retention. Common Level Two devices are thumb breaks, hammer loops or trigger guard locks. These holsters are very popular for open carry or law enforcement. Level Three: A Level Three holster has an additional retention device built into it. One common design is a thumb break or loop in addition to a trigger guard lock. Add in the holster’s Level One friction and that makes three levels of retention. Level Four: A Level Four holster has three retention devices in addition to passive retention for a total of four mechanisms. These holsters are much rarer than Level Three holsters and are the ultimate in holster retention. The gun is definitely secure, until the wearer draws it deliberately. So, if your kydex holster allows the gun’s trigger guard to seat with a “click” sound, technically it is still Level One retention since you don’t have to do anything other than draw the gun to remove it from the holster. If there is a lever that you must press to free the gun, that’s Level 2. 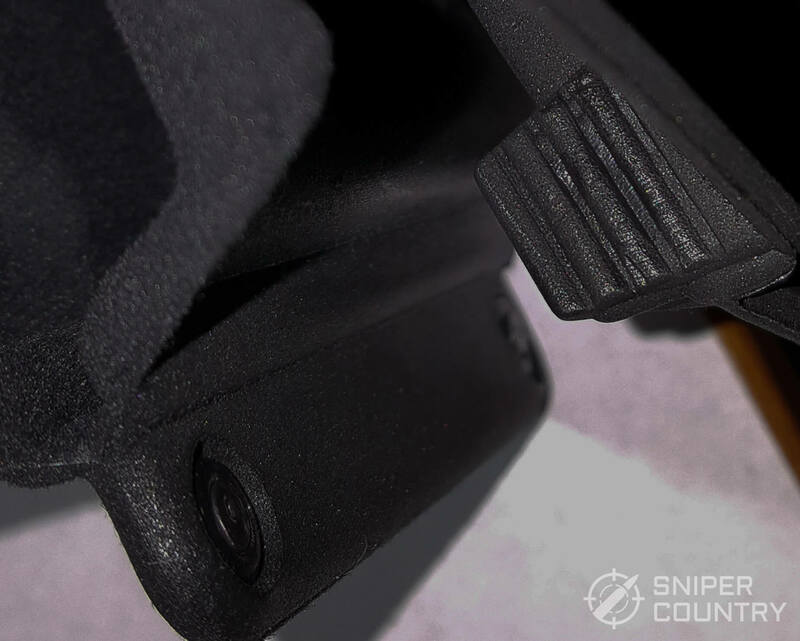 If there’s a strap or solid plastic loop over the rear of the slide that you must move in addition to pressing a trigger guard lever, that’s Level 3. As stated above, Level 3 holsters are mostly carried by law enforcement personnel. Level 4 holsters are in the realm of the military and similar units – they are not common, at least around here. I’ve not even seen any for sale in local stores. So now you should be able to make a holster-buying decision and get one with the level of retention you desire. 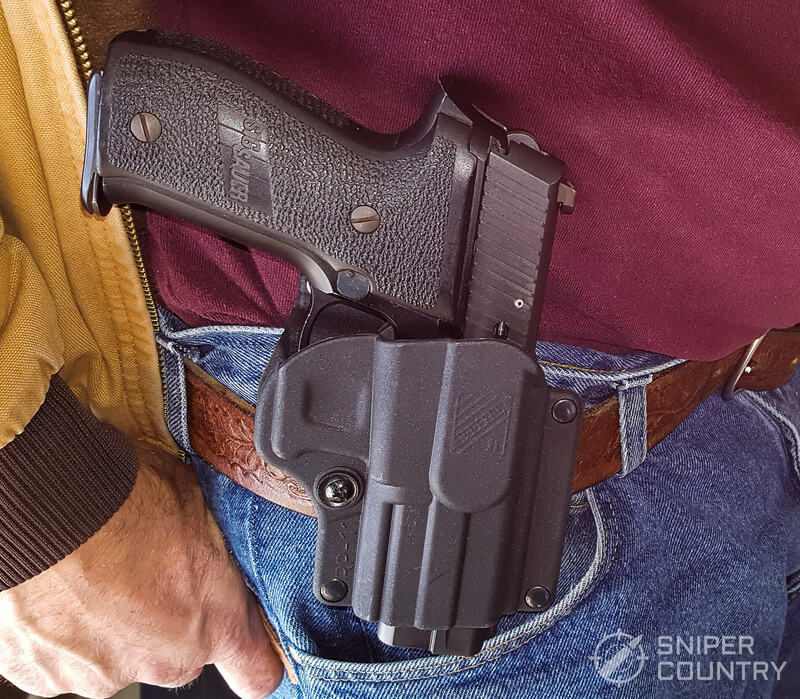 If it’s built properly, a Level 1 holster works well for concealed carry. 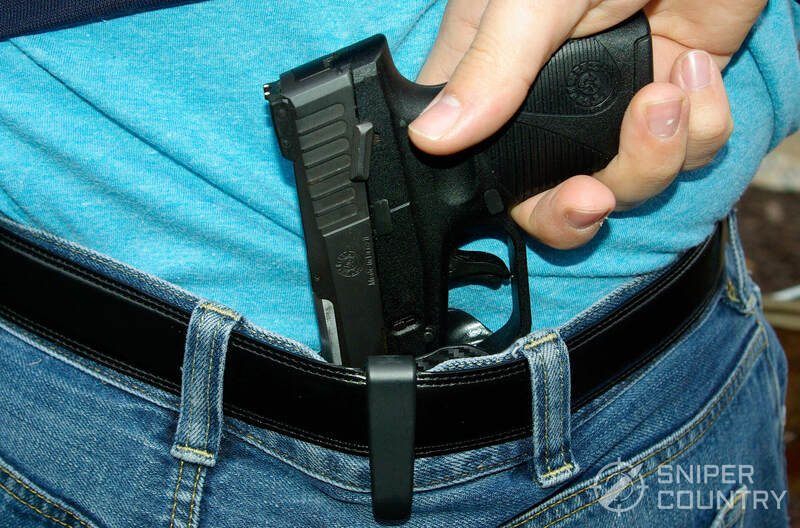 Now, let’s examine some of the more popular concealed carry methods. Later, we’ll look at some specific holsters as we go through the above list. The IWB holster has, as stated, grown in popularity over the past couple of decades. 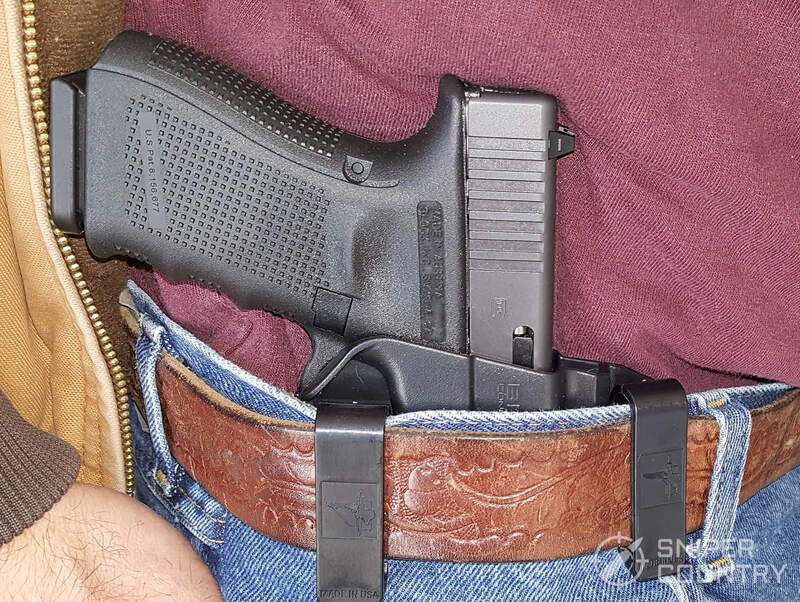 This holster usually features one or sometimes two clips that fit over your belt with the holster body itself hidden between your pants waistband and your skin or undershirt. 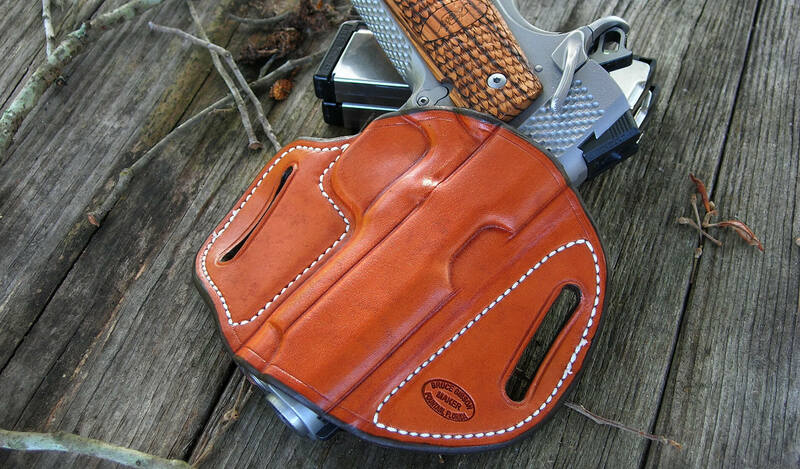 It is a very good way to hide the fact that you are carrying a gun, given the right gun and holster combination. 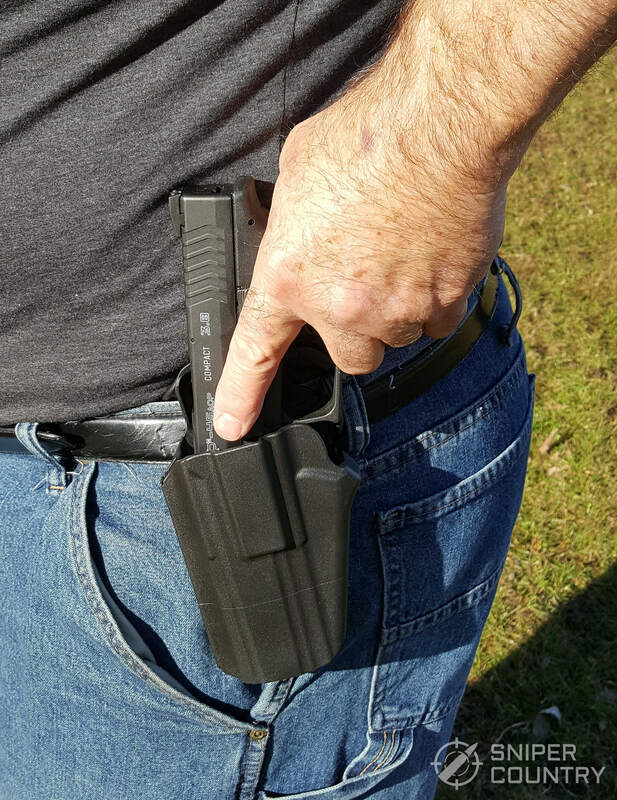 The main advantage of an IWB holster is that it doesn’t take a large coat or jacket to conceal it. 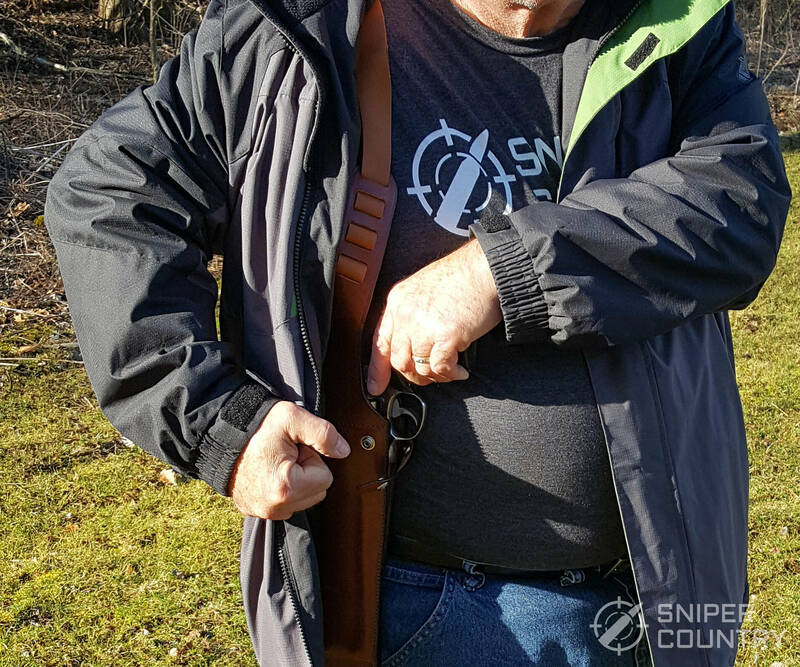 The holster is like an iceberg – most of the gun is “below the surface” of your belt line and hidden, so a button-down shirt or large T-shirt can be all that’s needed to hide the gun. The OWB holster has a lot going for it. The gun is exposed, with the full grip ready for your hand. If you are wearing a larger cover garment such as a big hoodie, jacket, coat, etc., then an OWB holster may work for you. People who live in colder climates tend to wear this holster more than those who live in more temperate zones as a cover garment can be worn all year (in some locales). Where I live, in the Midwest, I could utilize an OWB holster for about four months out of the year. At the time of this writing, it is 13 degrees outside so a parka or other coat is required. I could hide a large gun if I wanted to. The ankle holster is a specialized tool for a specialized job. These holsters strap to your weak-side ankle by the use of some sort of strap. New designs tend to use Velcro or other fastening agent, while others are made of strapless elastic that pulls on like a sock and are held in place by friction. Some of the more expensive ones will have a garter-style upper strap that “locks” the holster in place, not allowing slippage. These holsters tend to be made for small backup-type guns and are sometimes carried in that role – backup. They usually are not employed to carry the primary CC gun (unless you’re going someplace where fashion dictates the use of an ankle holster). Who doesn’t remember James Bond drawing his Walther PPK from underneath his tuxedo jacket? That iconic image is burned into most of us older movie-goers’ consciences. Another great movie character that wore a shoulder holster was Dirty Harry. When he pulled that Model 29 from beneath his sports jacket, he meant business. One thing both of these examples have in common is that they both drip with machismo. A shoulder holster is a very handy (and famous) item. It would seem, and Hollywood would have us believe, that only a Bond or Dirty Harry should use one. This machismo thing is hogwash, of course, but it makes for great movie legends. Here’s an example – when was the last time we saw an “average-normal guy-type” TV cop dramatically sweep his jacket out of the way to draw his shoulder-holster-mounted 2-inch-barreled Detective Special? Shoulder holsters can be very useful items in the right circumstances for us common Joes. They come in two basic styles – either a vertical or a horizontal draw. 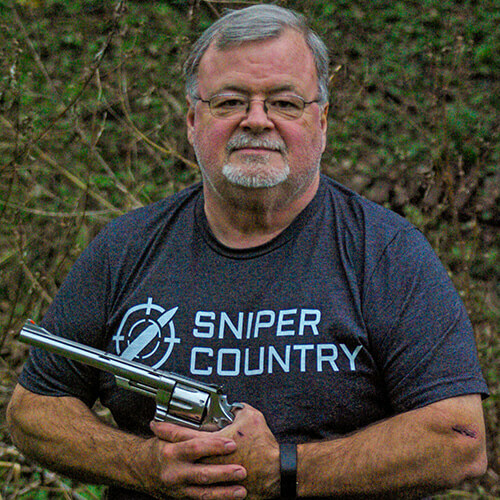 The vertical draw (Dirty Harry) carries the gun muzzle down and is favored for longer-barreled hunting revolvers, as it keeps the barrel out of the way by its muzzle pointing down. The draw is usually accomplished by unsnapping the safety strap (if present) and pulling the gun down and out through the open front of the holster. The horizontal position (James Bond) is usually used for short-barreled guns, usually semiautos but not always. The holstered guns’ barrel is parallel to the floor with the muzzle pointing to the rear. To draw, simply unsnap (again, if it has a safety strap) and pull the gun straight forward. Both have their uses, with the horizontal one being used more for the smaller semiautos that tend to get carried for protection. The draw can be very fast, depending on what type of jacket you’re wearing. Shoulder holsters can be a source of unintentional discharges unless you keep your finger off the trigger until the draw is complete. It’s easy to shoot yourself or someone else if you botch the draw. Now we’re getting into territory that I am very familiar with. I carry either a Taurus Spectrum .380 or a Ruger LC9S in a pocket holster most of the time I’m away from home, where legal. 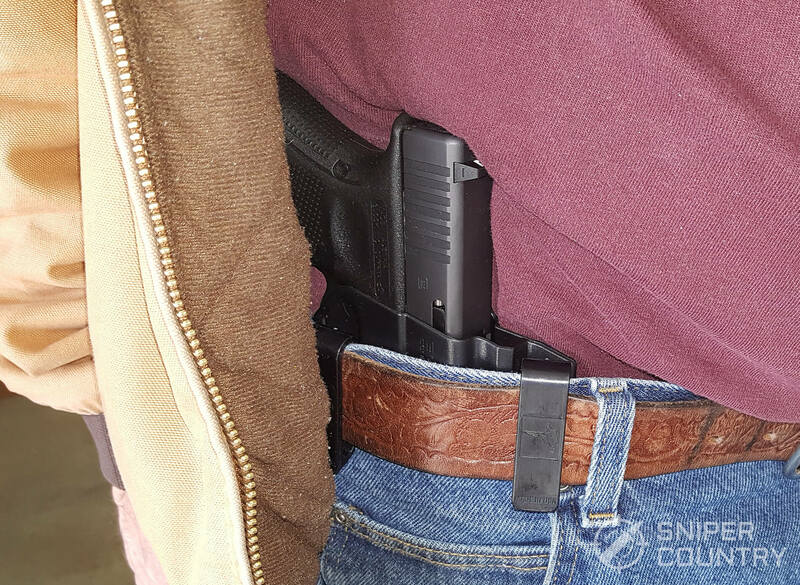 A pocket holster is a great way to have a gun with you without a lot of preparation and bother…just stick the gun in the holster, then in the pocket. If you want to pocket carry, just make sure you do two things: first, use a holster. Don’t just stick the gun by itself in your pocket. The holster does two things – it covers the trigger and orients the gun with the grip up for an easy draw. Second, don’t carry anything else in the pocket that carries the gun. There should be no change, pens, etc. In that pocket that could get stuck in the holster and possibly cause an unintentional discharge by getting trapped against the trigger. Keep the pocket reserved for only the gun. 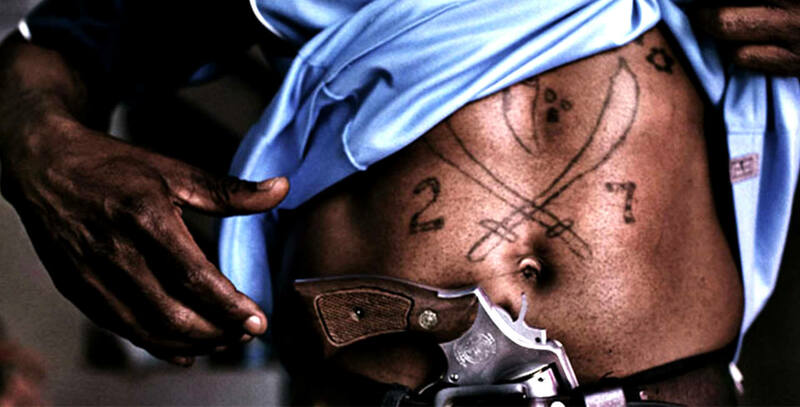 The belly band (so-named because it is a wrap-around band made of a synthetic material that fastens around your mid-section, under your shirt) is one of the most concealable ways of carrying a gun. 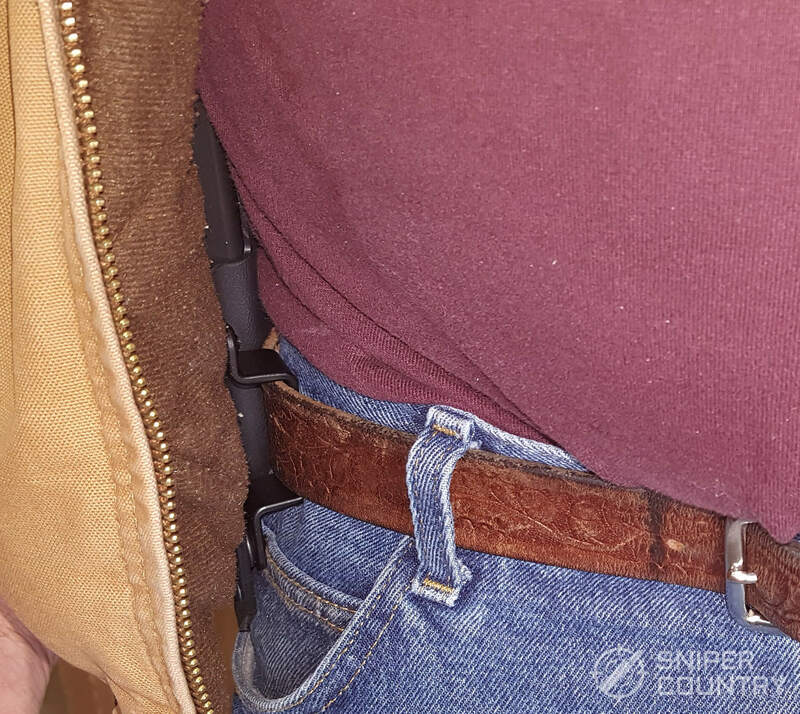 I think some writers have this type of holster in mind when they talk about “deep concealment.” With the band under your shirt (unless your body shape is not conducive to such a rig), hardly anyone can spot the gun you are packing. These types of holsters have grown in popularity over the years. It holds the gun securely. You don’t want your gun wobbling around-that’s unsafe. It covers the trigger guard. At the very least, it HAS to do that. It is built of quality materials. I don’t know how many holsters I’ve tossed that have worn out. I finally quit buying cheap holsters and learned my lesson. 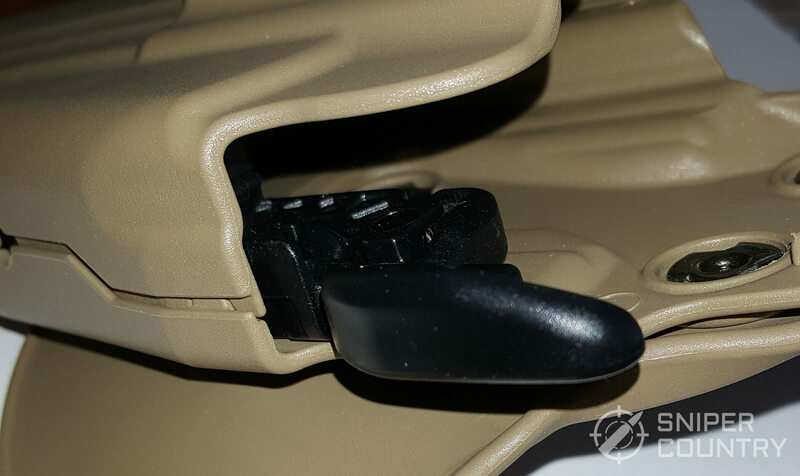 It has some sort of channel or opening for your guns’ sights so that they do not rub against it (kydex holsters). Now…let’s look at some specific holsters. We have chosen holsters for specific, popular carry guns in order to give them a hands-on test. All the holsters that I will write about have been worn by me or a friend, so information was gained first-hand. Please remember that I am left-handed, so any holster I mention that I have personally used obviously comes in both right- and left-hand versions, or are ambidextrous. Prices shown are the most recent ones I could find on the individual manufacturer’s websites and are current as of this writing but you may be able to find the holsters cheaper by the time this article is published. This holster is a perfect fit for me. 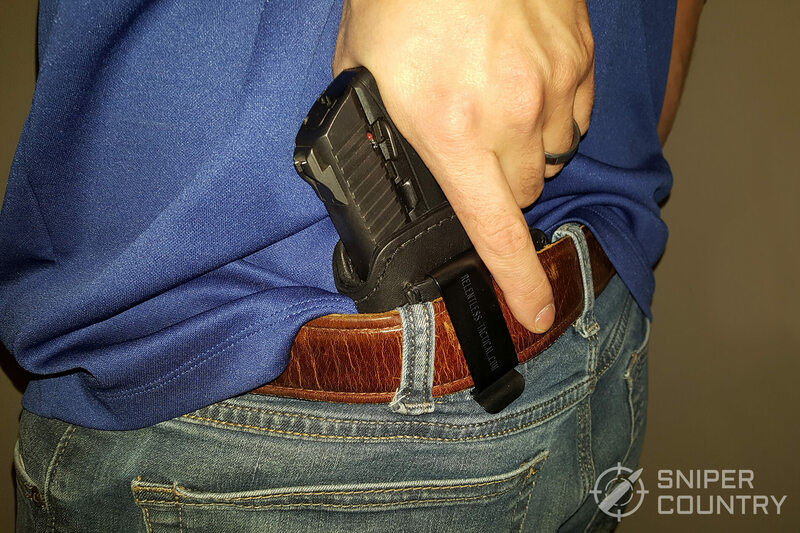 Even though I have a “Michelin-round-my-middle” body style, this holster slides onto and off my belt easily and the clip is securely fastened. It is one of the easier IWB holsters I’ve used to put on and take off my belt. It fits my Taurus G2C like the proverbial glove. 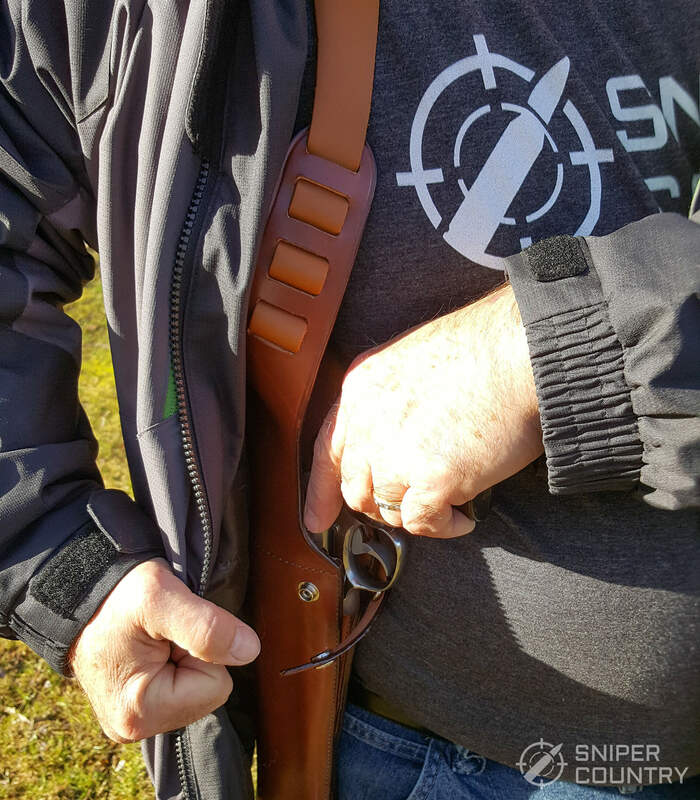 The wide belt clip holds securely to my belt from the inside and keeps the holster in position. I have no problem tilting the holster a bit, grip-forward, without adjusting anything. 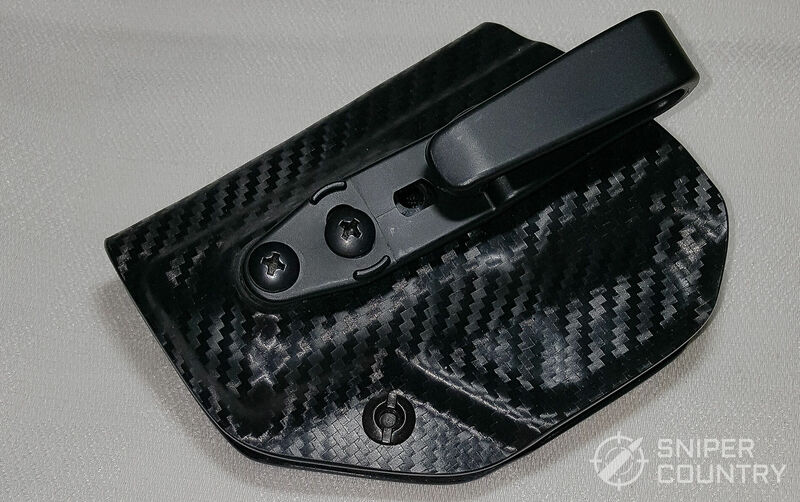 The carbon fiber construction is a little more attractive to my eye than plain black kydex. 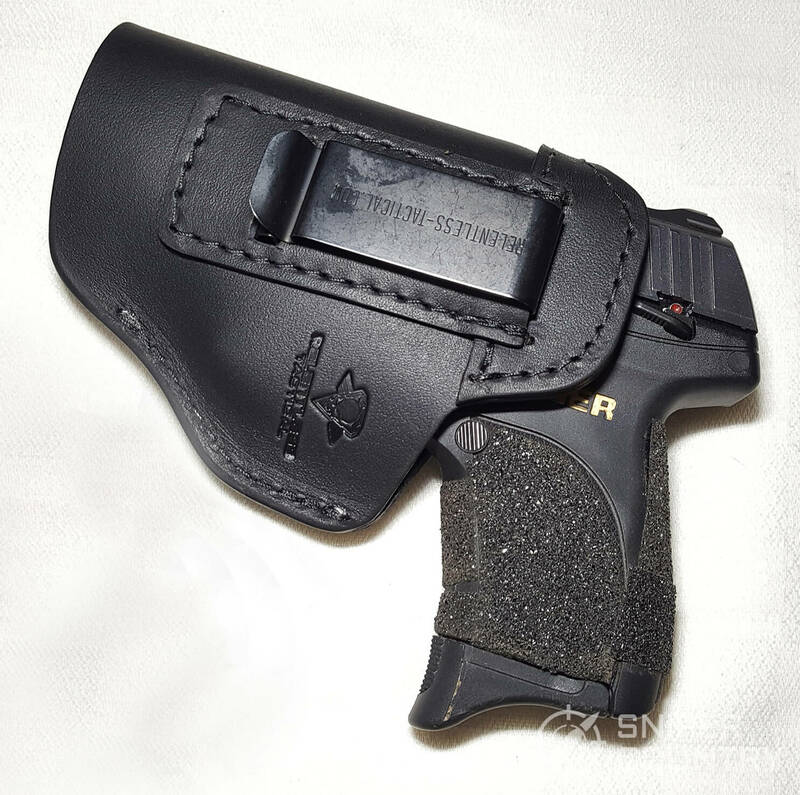 This holster is a good buy, and they make a lefty version of it for most guns, which I need. If you’re wanting to carry IWB for not a lot money but yet still have a good holster, this is a good one to try. I mentioned that this holster was easy to attach and remove from my belt. I’ve had IWB holsters that required I undo my belt and loosen my waistband in order to mount the holster’s clip. I have no such problem with this holster. It slides between my belt and T-shirt easily and, once there, it stays put but is easy to remove if you want to do so. The craftsmanship is excellent, with all surfaces and edges polished to a high luster. There are no rough spots. As you look at the photos, notice the wide clip. I prefer a wider clip on my IWB holsters – they’re just easier for me to manipulate with my arthritic-prone hands, plus they hold the holster in place very well. There’s nothing wrong with a narrower clip (as is mounted on the holster described below), but I like a wide one. 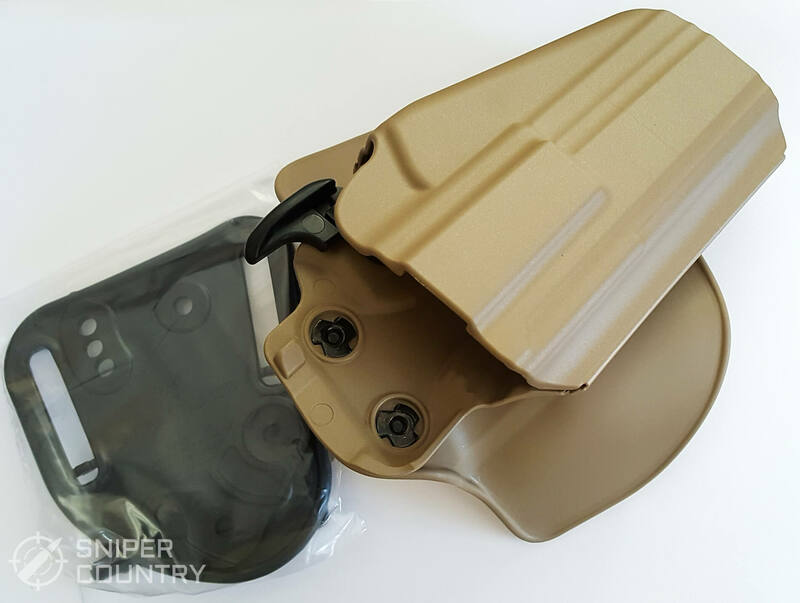 If you want two clips, Concealment Express makes one – it is a hybrid, using a backing of a rubber-like material with ventilation holes throughout attached to a kydex shell. There is one clip fore and another aft to truly anchor the rig on your belt. I usually don’t require two clips on my holsters, as I find one works well but if you want to be really sure that the holster is going to stay put, there is one for you. Another feature about both Concealment Express holsters that I like is that they both give you an adjustable retention screw. This is nothing really new, or rare – it’s just that some makers of lesser-expensive holsters omit this valuable feature. If you’ve had the holster a while and find that it’s not holding like it used to, simply tighten the screw. On the other hand, if it takes two men and a boy to pull your gun out of the holster, loosen it a bit. You have the control here. 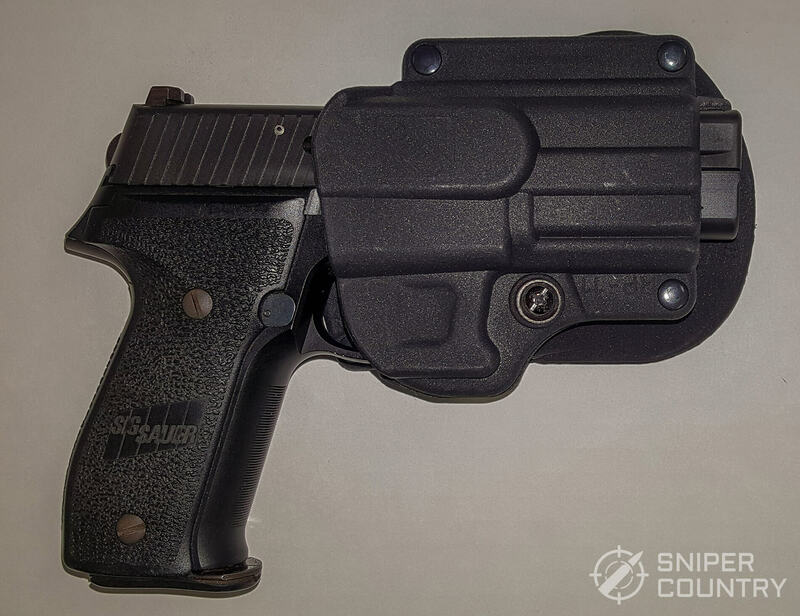 In terms of construction, this holster is built a bit differently than the one above. It has to be, because it was designed from the outset to be ambidextrous. The holster is the same when viewed from either side – there is no “inside-with-the-clip” or outside. It has to be symmetrical so that you are able to attach the clip to either side. Why is this feature important? Well, discounting us lefties out there and the obvious value that this holster’s ambidexterity has for us, if you are right-handed but want to carry your gun in the small of your back, you would set it up as a left-handed person would so that the gun’s grip is accessible with your strong hand. That term simply denotes the fact that there is a space between the clip and the holster that allows you to tuck your shirt into it. This gives even more “invisibility” to your gun, as your shirt is pulled over it. Printing is not an issue – the holster was designed properly to keep the gun’s outline hidden, even under a tucked shirt. It is not hard to move the clips to the other side, but could be a bit easier. 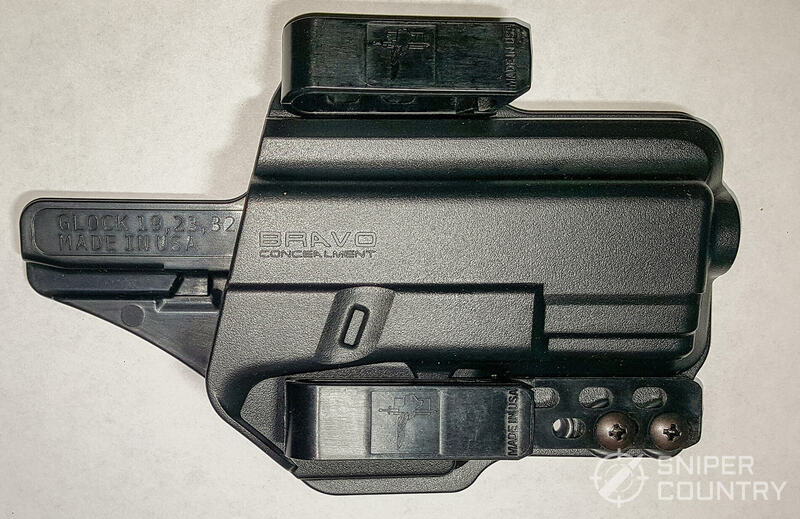 As the photos show, the clip-attachment channel protrudes a bit from the smooth inside of the holster. 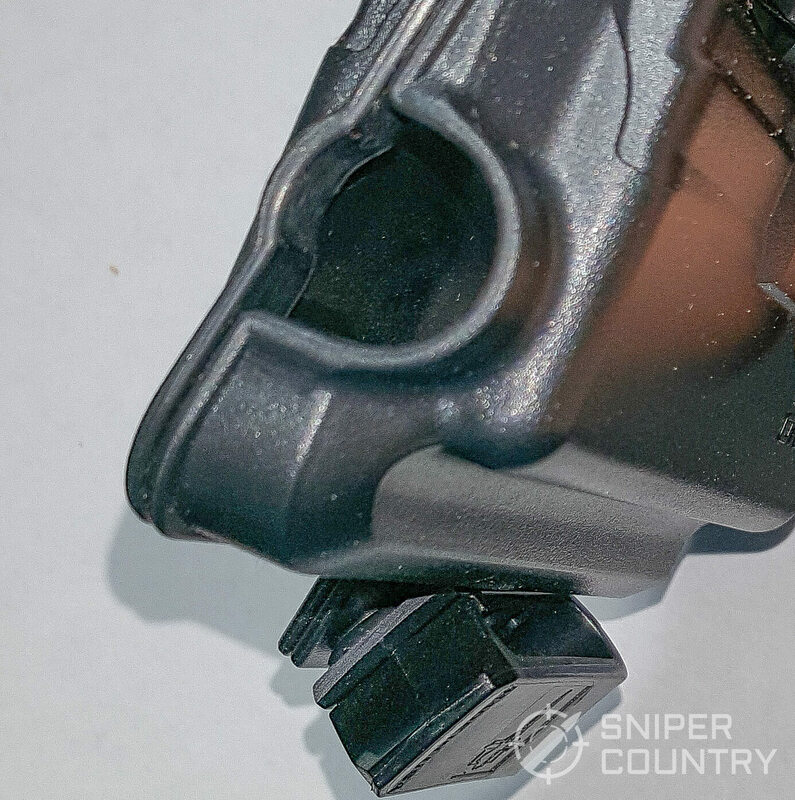 This is to keep the attachment hardware from coming into contact with your gun. This hardware consists of two screws and two nuts. You unscrew the attachment screws while you’ve got a finger inside the holster holding the nut in place. After both screws/nuts are off, move the clip to the other side and stick a screw into one of the mounting holes. Hold the nut in place again with your finger, on the inside of the holster as you thread the screw into it. This is easier said than done. One of my sons, who has skinnier fingers than I do, moved the clip to the other side for me. He only dropped the nut once. After the first screw/nut is in place, do the other one and tighten securely. Some blue Loc-Tite on the threads wouldn’t hurt. It really isn’t hard to switch the clip over to the other side but you do need to do it over a table or something so that if you drop a screw or nut, you won’t lose it. You also have a tension screw on this holster, as mentioned above. If the holster is too tight, simply loosen the retention screw a bit. That’s about all there is to getting this holster ready to carry. We got one for a Taurus PT-709 Slim and it fit very well. The molding was right on. I was impressed with both Concealment Express holsters. They were well-made, with an excellent smooth finish. 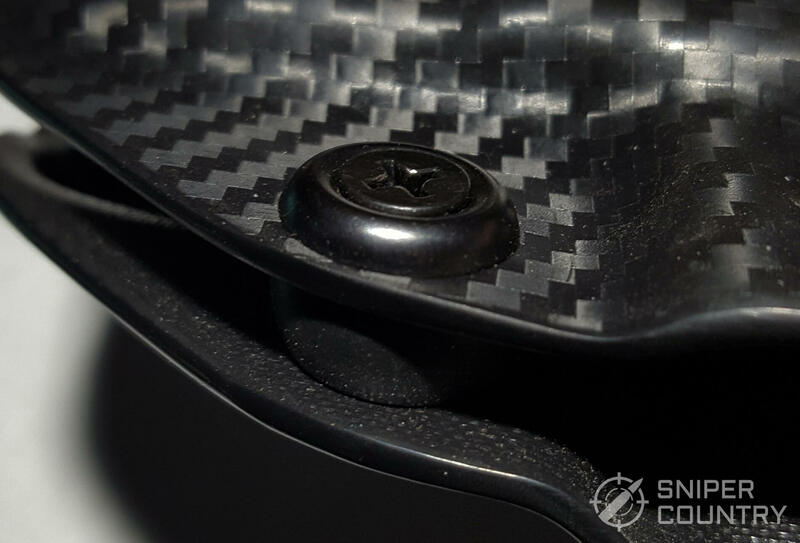 The carbon fiber look doesn’t hurt, either. Granted, aesthetics where kydex holsters are concerned is not big on the list but you take what you can get. It beats just plain black. Speaking of which, colors are available – check the website for specifics. The first holster discussed above with the Taurus G2C is fast becoming my favorite IWB rig. The holster works great and I feel that the gun is totally secured until needed. Plus, it’s “easy on – easy off”. 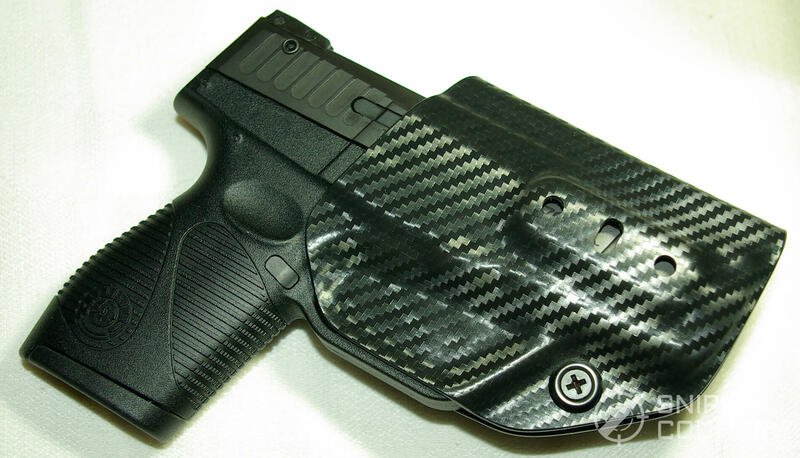 Concealment Express holsters seem to consistently earn good reviews. These holsters represent a really good value – check one out and I’d bet you’ll like it. They are widely available online through Amazon. The Glock 19 is perhaps one of the most popular carry guns out there, so I got this holster to see how it would carry it. From the get-go, this holster looks heavy-duty but only weighs 2.8 ounces, according to my scale. I’m not sure if the photos will show some of the finer points I’m going to mention, but hopefully you’ll get the idea. 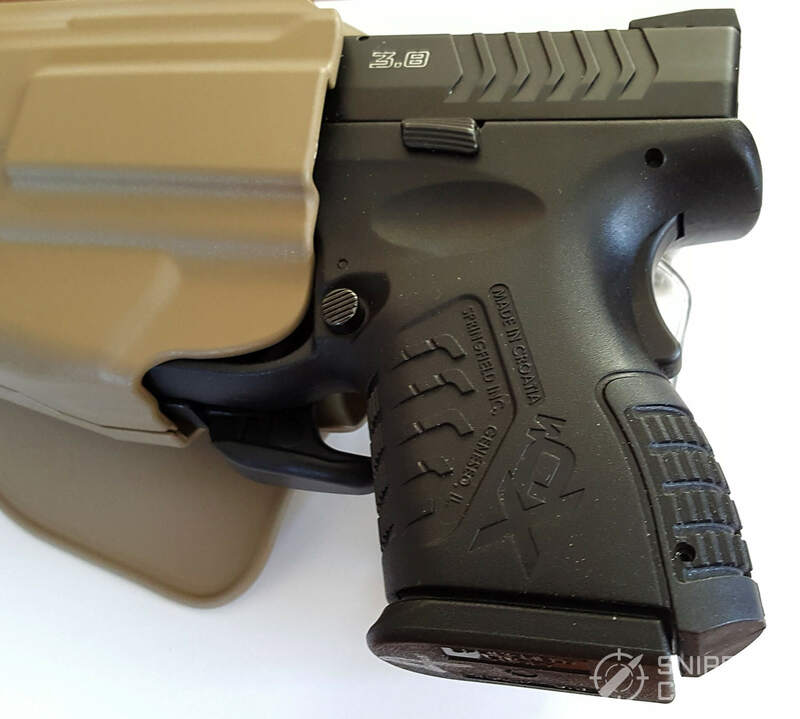 The kydex is .080 thick, which means that the holster doesn’t add much width to the gun. Also, the belt clips are plastic but seem very rugged. One of the big things that you notice immediately is that the front belt clip is canted inwards qt 10 degrees. This helps hold the grip of the gun closer to your body, with less printing the result and is a good thing. I have the holster on my desk in front of me and for the life of me cannot figure out what they mean by “One of the few holsters offering retention”. When I read a statement like that, I start looking for Level 2 levers, etc. There are none. All I see is an expertly-molded kydex holster with a very positive trigger guard snap-fit, which is still Level 1. From that standpoint, it does offer retention. Another observation (one reinforced by watching the embedded video on this holster’s web page) is that the 1.5” belt clips are removable. 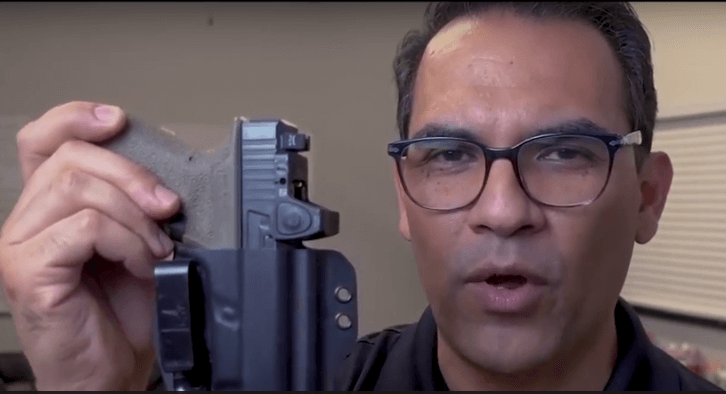 The fellow in the video (company owner Rene Aguirre) shows his Glock 17 in one of these holsters but has removed the front clip. He says that he doesn’t need two clips, so one has been removed from the gun. My point is that this holster will allow you to do that yet still retain the rigidity of the mount. If you value maximum “hold”, use both clips. One other thing I noticed is that there is a round hole in the bottom of the holster to allow debris, water, etc. to fall out and not build up inside where the muzzle of the gun would rest. OK…the real reason it’s there is to allow suppressor-ready barrels with a protective threaded cover to be carried, but I still like the fact that it will allow stuff to fall through. I think this is another good idea. I did discover, since I am left-handed and always check for those holsters so oriented, that Bravo Concealment does make lefty holsters – ten, as of this writing. This is up from the one that they advertised a couple of months ago. The lefty holsters that they make are OWB-style and cover several of the more popular Glock models. Those models include the 19, 19x, 23, 32, 45, 19 MOS, 19 Gen 5 and 19 MOS Gen 5. 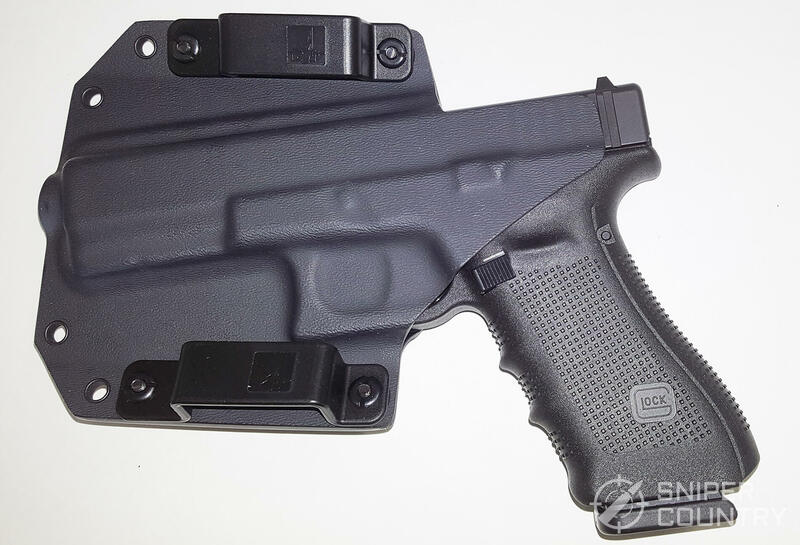 They do make a lefty Torsion IWB holster for the Glock 43. The nice lady I communicated with told me that they are working to get more left-hand holster versions out there but that it will take some time. They also make both right- and left-handed magazine carriers, as well. The screws and nuts that hold the clips to the gun are well thought-out. 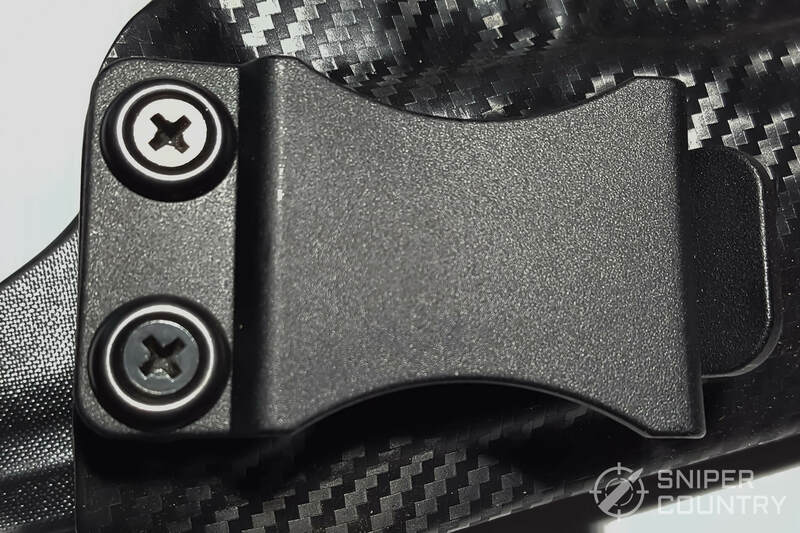 The screws are simple Phillips-head (nothing new here), but the retaining nuts on the back of the holster are not hex-shaped to fit into a similar recess in the holster like most other makers use but are round with one slot across their whole face. This allows you to tighten the screws with just plain screwdrivers until the threads catch – one Phillips, one flat-blade. After the threads catch, the screw protrudes through the nut and the slot has done its job, allowing you to start the screw. There are fat rubber washers in place to hold the screws and nuts immovable once set. Here again, another good idea. 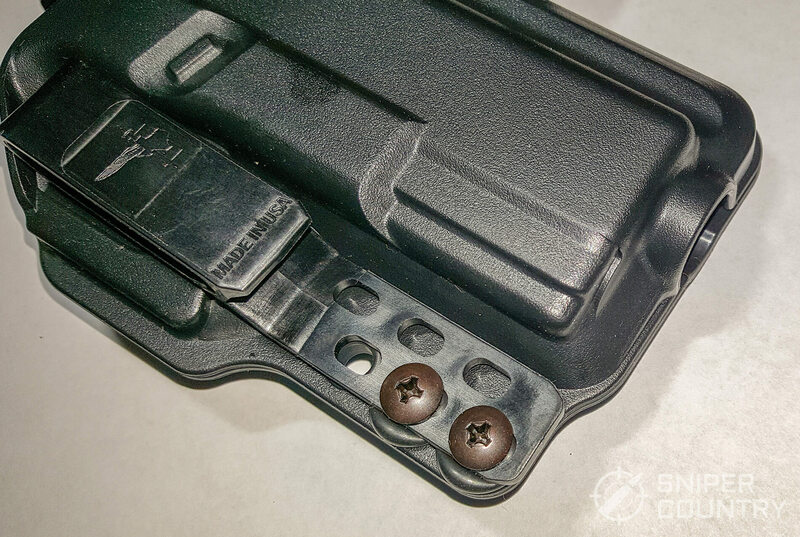 The retention screw arrangement is similar to that used by most kydex holsters makers. You have the same pliable rubber-type “washer” as is used above inserted into the holster, between its sides with a screw through it and a nut to aid in tightening the screw. 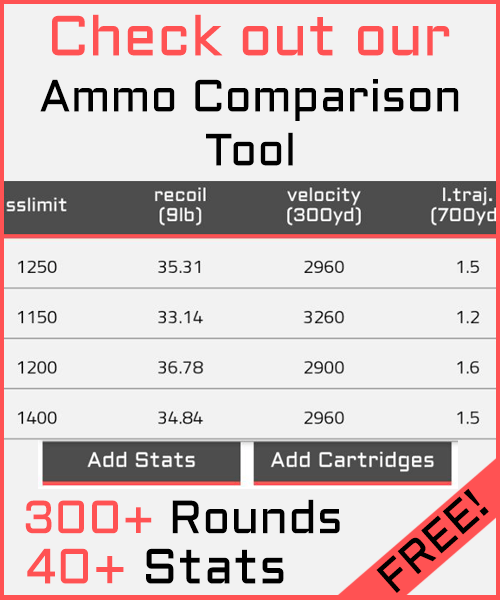 This is how you adjust the amount of retention you need for your gun. I’ve had holsters with this arrangement that needed to have that adjustment screw almost falling out to open the holster to the max to fit my gun, and then others that you had to cinch down all the way. The one here seems to be designed properly, as I didn’t need to go either way with it in order to hold the gun securely yet still allow a fast draw. Another aspect of the hardware used on these Bravo Tactical holsters concerns the rivets and screws used to hold the holster halves together. 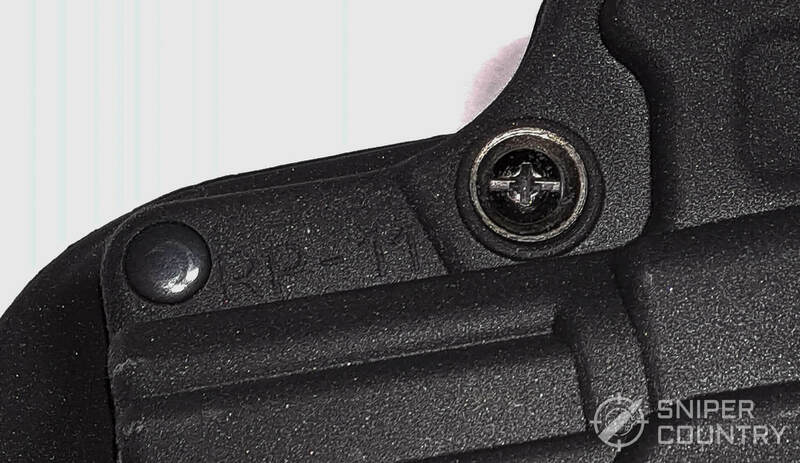 On the Glock 19 IWB holster, there are two large rivets and four screws holding the holster together. The rivets are heavy-duty, but, to Bravo Concealment’s credit, they couple the rivets with screws, rubber washers and slot-head nuts that you could remove if so desired. Many holster makers just use rivets. The screws hold the clips in place. This allows you to move the rear clip (the front clip has no other holes drilled) by placing the two screws in of six positions (each screw has three corresponding holes). If you want the clip lower, move it. If you want to move the clip outwards, move it. 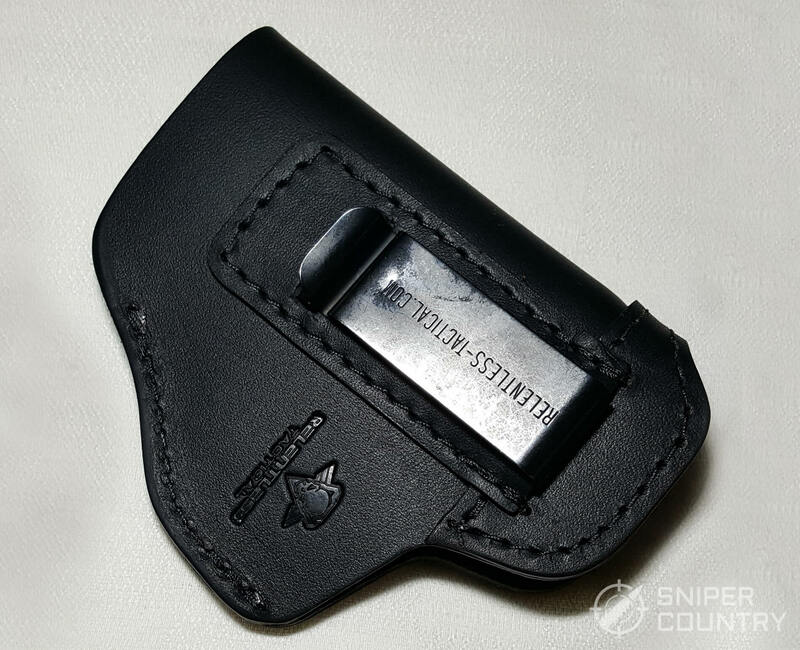 This allows you to customize the position of the holster on your belt. The clips themselves are made out of a tough-looking polymer. 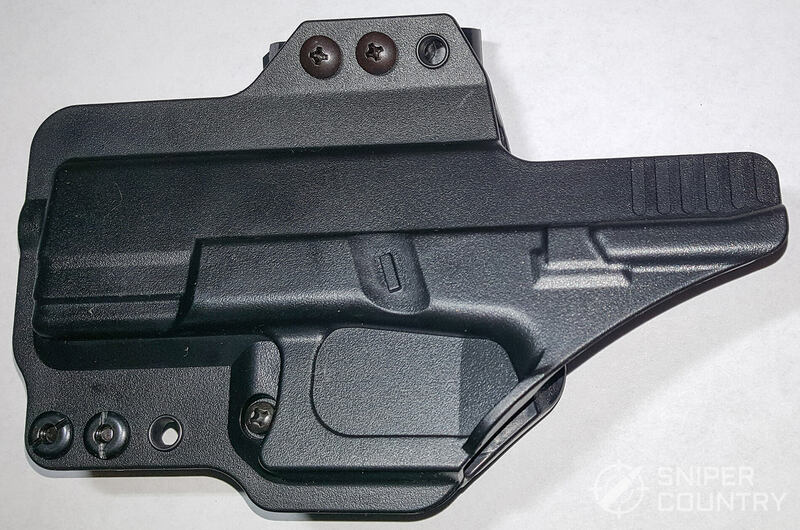 The fifth screw is the retention-adjusting screw, mounted on the holster’s body. Did I Grab The Right Holster? 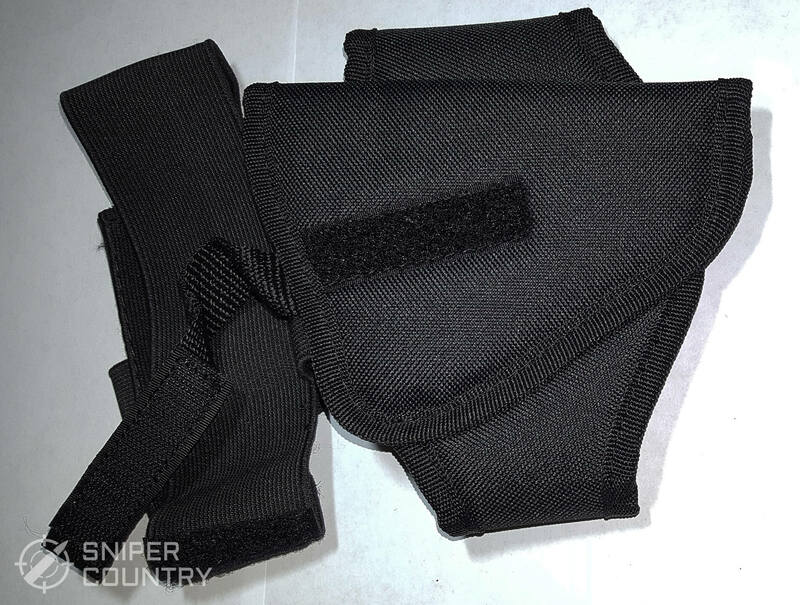 One thing the IWB Bravo Concealment holster does that the OWB holster (below) doesn’t is that it identifies what gun(s) it’s made for on the inside of the sweat guard. This one says “GLOCK 19, 23, 32” and “MADE IN USA” below the gun models. That way, if you are in a situation where you have to grab the holster quickly, you can tell at a glance that it’s the right one. I like this holster. I purposely got it for a Glock 19, since that is a popular carry gun but it‘s available for many different models. Check out their website for more information. I think Bravo Concealment has some winning holsters and accessories in their product line…they seem very well-built and professional. 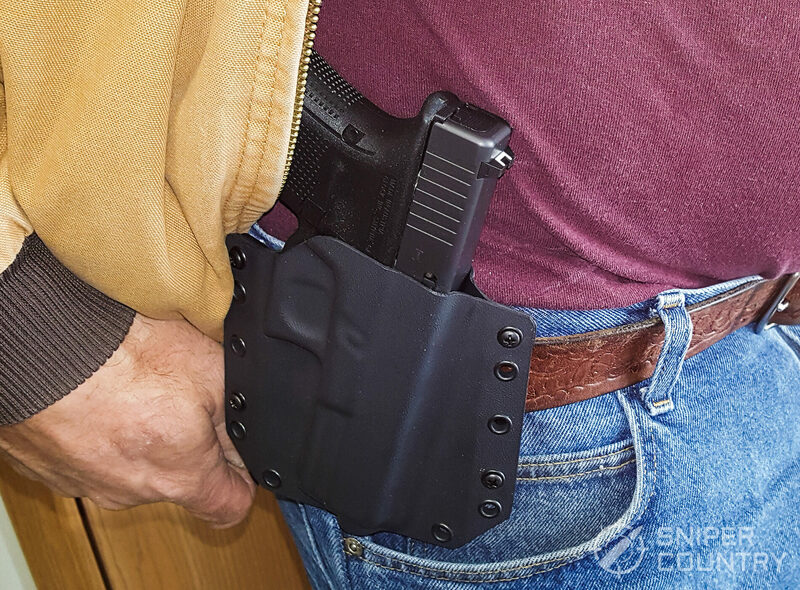 This holster is made from top-quality hide and has a rugged clip. One feature I like is that the top edge of the holster is reinforced with another strip of leather, allowing it to stay open for one-handed reholstering. The one I got fits single-stack pistols such as the S&W Shield, Glock 42/43, Springfield XDS, etc. It did not specifically list the Ruger LC9S as a compatible gun, but mine slips into the holster like it was designed for it. I got this one in left-hand and the next one in right-hand so as to get a better idea how they make holsters for those of us who shoot with the wrong hand – I was not disappointed. 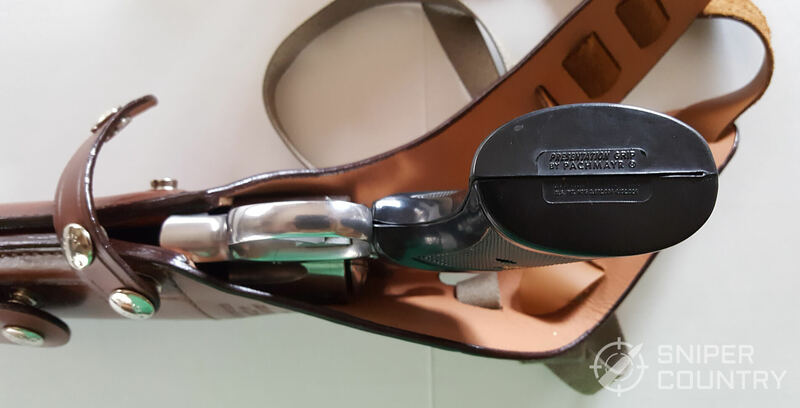 Some southpaw holsters I’ve had over the years were simply the same holster as the company’s right-handed version but with the clip obviously just added as an afterthought on the other side – nothing like that here. You can tell these were designed from the ground up as left-handed holsters. 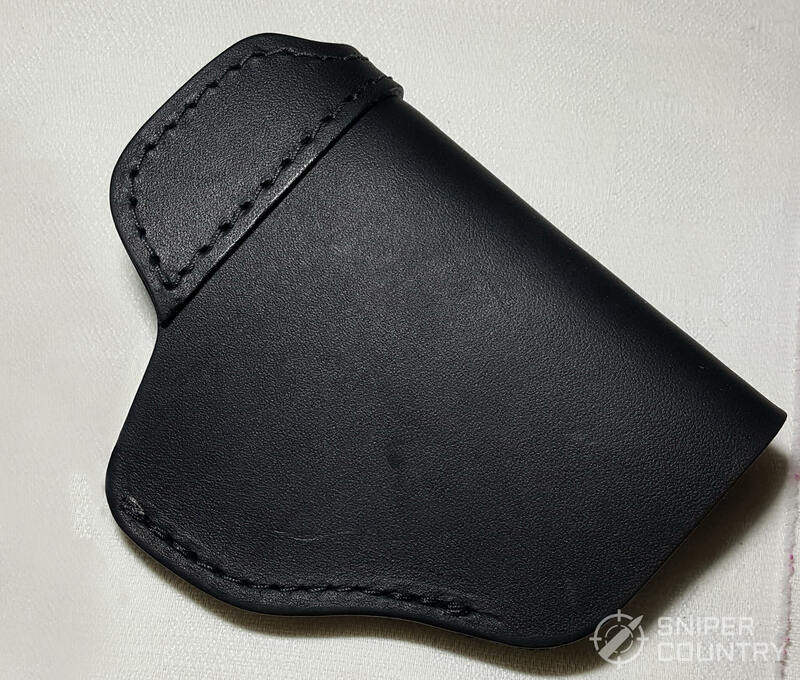 Finished in a slightly-polished black, the holster has the brand information on both the holster body and the clip. As mentioned above, the opening of the holster is reinforced with an additional strip of leather sewn to the edge. It’s about three-quarters of an inch wide and does a great job of keeping the holster open when the gun is out of it. What this means in practical terms is that you can re-holster your weapon one-handed. I’ve had plenty of experience with IWB holsters that collapse when you draw the gun. With these, you must pull the holster off your belt and insert the gun, then stick the combination back inside your waistband. 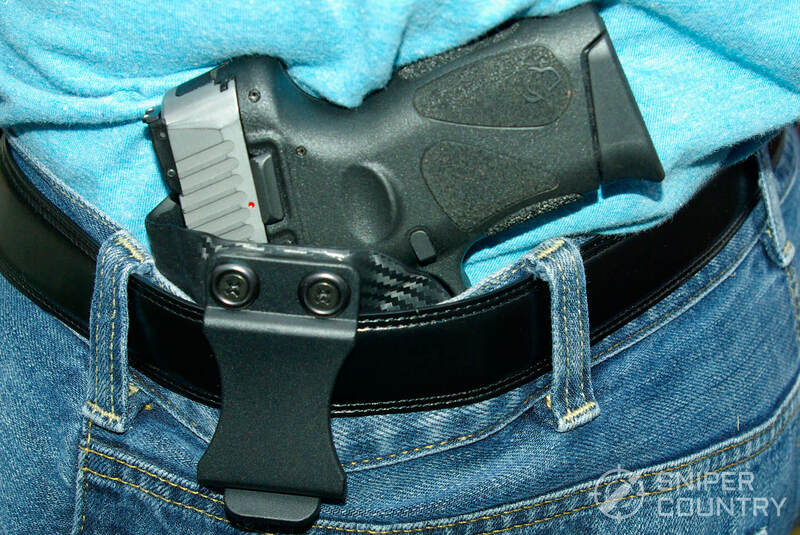 If the holster is made out of a synthetic material, sometimes you even have to “drop your drawers” in order to place the holster and its clip back in position. I am very happy to say that, with the Leather Defender, no such gyrations are necessary. Being made of leather, it slides right into place with your pants in the “up” position. The stitching on these Relentless Tactical holsters is, in a word, great. I have made several leather holsters over the past 40 or so years, with varying results and I recognize good stitching when I see it. I’ve found that the hardest part of my holster-making process was the stitching. It’s not easy to make a functional, great-looking holster out a material that was covering a cow’s backside not that long ago because you do have to sew the pieces you’ve measured and cut out together at some point. Just getting the stitches even can be a problem. Sure, you can use a little roller-wheel-spur-type tool to lay out the indentations where the stitches are supposed to go, but then what? I’d gotten to the point where I was drilling, with an actual drill and bit, the guide holes to aid in needle insertion instead of using the more traditional awl to poke through the leather. The waxed, zillion-gauge thread that you have to use is not easily inserted in the holster…having to push the large needle part way in and then pull it and the thread the rest of the way through with a pair of pliers gets old. Plus, if I got off a tiny bit in my hole lay-out, it showed. Another area that could go wrong was if the thread tension wasn’t the same all the way around, some stitches would be literally sunk into the leather while others floated above. Making leather holsters wasn’t the easiest thing I’ve done, especially with the very basic tools I had. Why do I mention this? So you can appreciate the job that Relentless Tactical does. Relentless Tactical has it in spades…very nice stitching with even tension on the thread all around and beginning/ending holes nicely finished. I know, they have machines that do this – I’m not living in the 19th century – but it’s still something that I’ve seen messed up on other commercially-produced holsters. Stitching, to a leather holster, is like glue or rivets is to one made of kydex… if it fails, the holster literally comes apart. Relentless Tactical does a great job with this aspect of holster production and you can see the care they put into their manufacture. Another feature I noticed and appreciate is the semi-polished finish this holster has. It is not what I’d call shiny, but you can tell that some real work went into the finishing process. Again, I know from my experiences that, just because you’ve finished or treated the leather, you don’t automatically achieve a professional result. Relentless Tactical does a nice finishing job before they ship the holsters out. 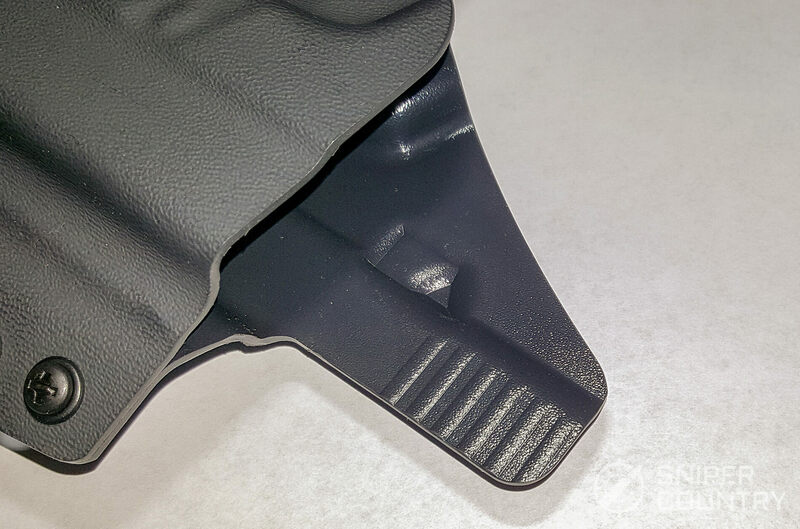 Unlike the above-mentioned kydex holsters, leather holsters usually do not have molded features that “click” over a trigger guard or other part of the gun. There are those leather holsters that have some molding built-in – I describe below how I attempted to mold my self-made leather holsters to the gun – but it usually isn’t as positive as molded kydex. Every little bump on the gun can be molded into a kydex holster but with leather usually you don’t have that option. So…does that mean that the holster lacks retention capabilities? Not on your life. Just because the gun does not audibly “click” into the holster doesn’t mean the holster lacks retention. I turned the holster, with an empty gun inserted, upside down over a bed and gave it some motion to see if I could get the gun to fall out. It never did. 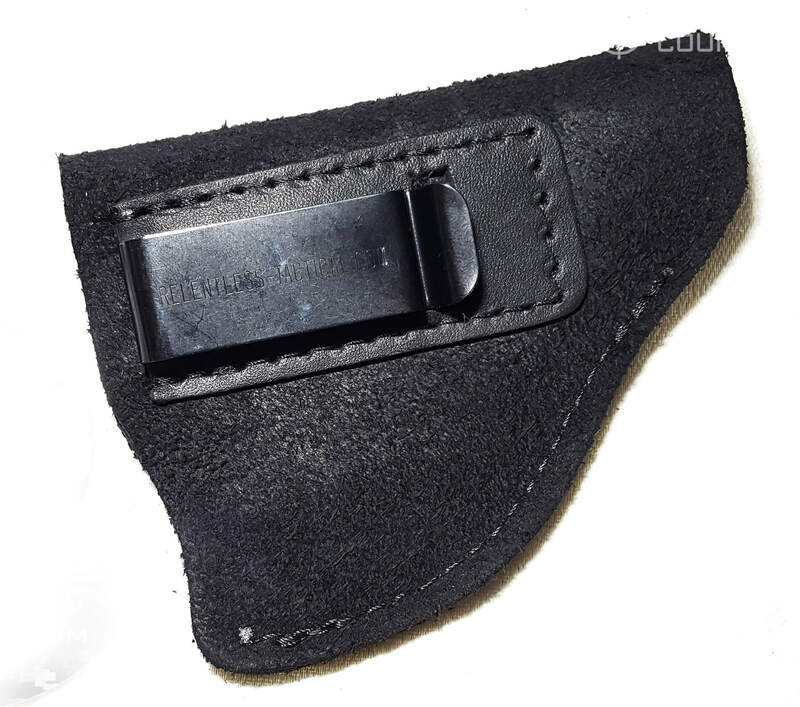 You have to remember that kydex is a relatively new holster material but leather holsters have been around for a few hundred years and folks have gotten pretty adept at making them properly. I carried my Ruger LC9S in this holster for a good long time and never once had a problem. It is a properly-made holster. I trust it. The second Relentless Tactical holster I got is the IWB model made from suede, to fit a S&W J-frame revolver. Why suede? Why revolver? As you can imagine, leather has two sides. What I mean is that, if you go to your local leather shop to buy a good piece of holster leather, one side will be finished – rubbed, polished and probably shiny. The other side, the inside, will be left “in the raw”, very rough and unfinished. Suede is a very “grabby” type of finished leather that is made from the smoother underside of the animal skin (sometimes lamb or goat) that is naturally softer. In our instance here, this holster was made from suede split from cowhide, which is nappier and rougher than that made from other animals. It is not slick. I am fortunate to have an Amish leather store within 10 miles of my house, so I see lots of different types of leather suitable for holster-making and have learned a bit from the folks who work there. Looking over their leather, I’ve discovered that suede is a very viable holster material. Being leather, it shares all the benefits that leather offers yet, being suede, tends to stay in place maybe a little easier than finished leather. My Ultimate Suede holster was, typically for cowhide suede, very unfinished-looking. This means that it got little pieces of leather debris on my backdrop photo cloth, it was so rough. It is that way on purpose so that it will stay where you put it as you clip it to your waistband. Being very rough and grabby is a good thing for a leather holster meant to stay in place. Now…would I want an OWB suede holster? Nope. It grabs any clothing item that touches it, so I don’t believe you’d want your jacket or shirt sticking to your holster. For IWB, it’s great. I’ve had other rough-out suede holsters and they performed well. On the other hand, suede holsters are difficult to put in position on your belt unless you lower your pants and place the clip exactly where you want the holster, because once you’ve set it in place, it isn’t going to move very easily. You can’t just tuck the gun/holster into your waistband like you can finished leather or kydex. But, again, that’s also a positive because it really stays put, as mentioned. In answer to the second question, why NOT revolvers? Not everyone carries the latest poly-framed, striker-fired gun. 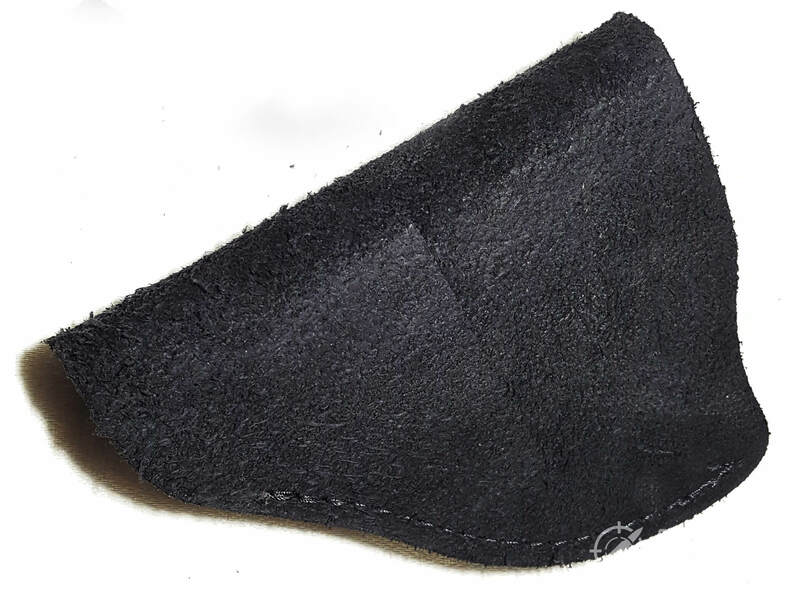 The advantage of suede for a J-frame’s holster is that will bend and mold itself to the gun’s shape. This is why I specifically got their suede holster for my revolver (they make it for semiautos as well). My Model 638 Smith and Wesson has a LaserLyte laser mounted on the right side of the frame. 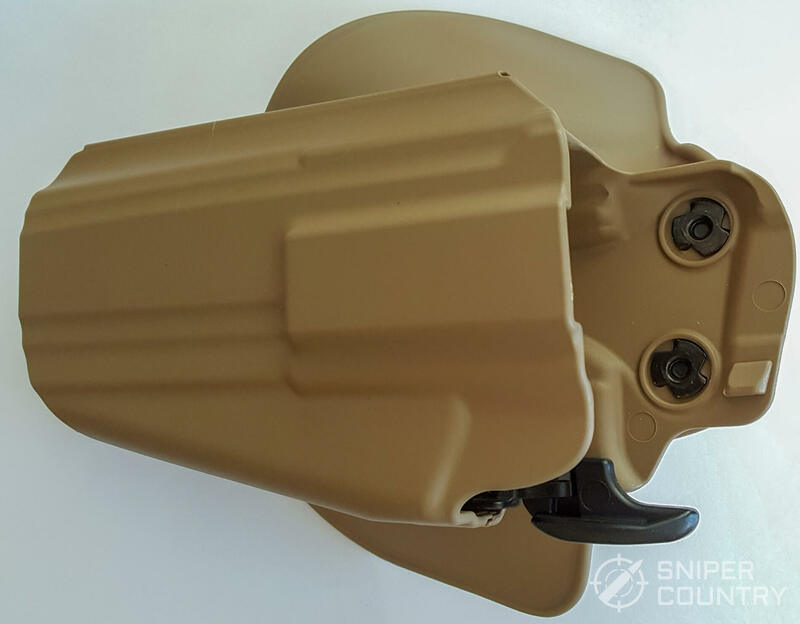 That would be a problem with a mold-to-fit kydex or other similar tight-fitting leather holster, but the forgiving, adaptable nature of soft suede will allow the laser to stay in place with no problems as the holster forms around its shape. Plus, you won’t damage the laser – it simply is cushioned by the forgiving nature of the soft suede. There are pros and cons with a holster of this type. If you are looking for a holster for your laser-equipped J-frame like I have, it’s great as it will mold to the shape of the gun. But, it could be a looser fit for many of the guns it’s designed for. Its very soft, forgiving nature could work against you if it’s used with a gun that marginally fits it. The one-size-fits-many holster is a compromise at best for many guns. However, if you are aware of that and have actually fitted the holster to the gun with a few hours of wear or other molding process you shouldn’t have any problems. One way to get this holster to fit your gun more precisely is something I’ve done for years as I’d finish a leather holster I’d made. I used to wrap the gun in plastic wrap, dampen the holster slightly, then work the leather around the inserted gun’s nooks and crannies. After drying, the holster would be a custom fit for that gun. If you have to guess at the size of the holster to order because your specific gun isn’t listed on the website but you know you want the suede holster, call the company – they’ll know which one is right for you. If I had to name one thing that could be different on either the Defender or the Ultimate Suede holsters, it would be the clip. It is on the skinny side. I know that makers use smaller metal clips so as not to take up too much room on your belt (or to give away the fact you’ve got a holster in there). I feel more comfortable with a wider clip…that’s just me. Will the skinnier one work? Certainly. I simply like wider ones. Don’t let my personal preferences influence you – these are great buys. The biggest draw for me, Mr. Really-Old-School, is they are real leather. You don’t see leather much anymore in well-made lesser-expensive holsters. For that, my hat goes off to Relentless Tactical. They offer some great, quality leather products for not a lot of money. They make other items, too – you need to check out their website. I got one of their OWB BCA (Bravo Concealment Adaptive) holsters for a Glock 17, since that is a popular gun to carry OWB. 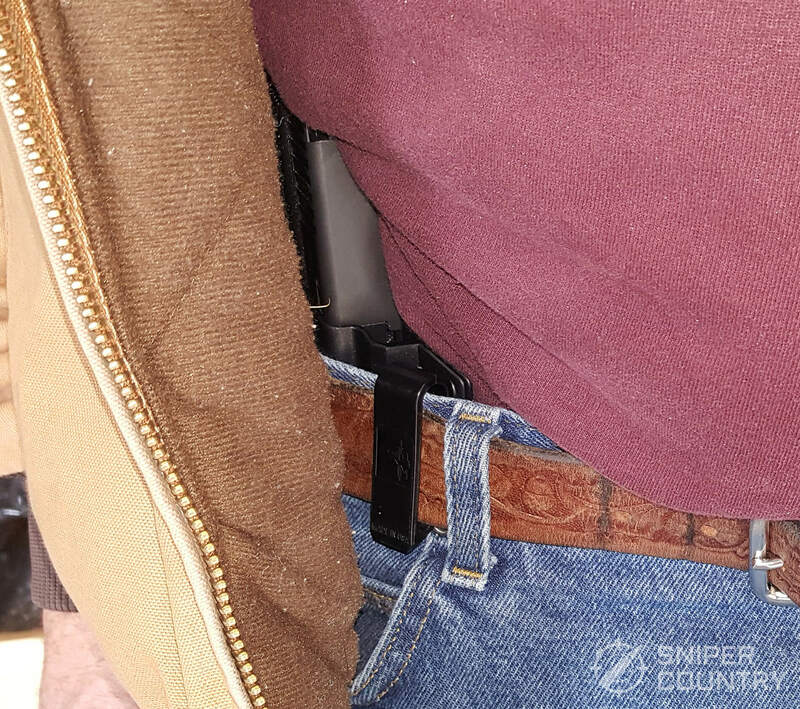 The phrase “Bravo Concealment Adaptive” is only used with their OWB holsters and (as far as I can tell) means that the holster is molded in a slight curve so the belt “loops” will hold the gun closer to your body – see the photos. It is an adaptation of what I used to call a pancake holster. This allows the belt loops to be spread further apart which helps hold the gun closer to your body. 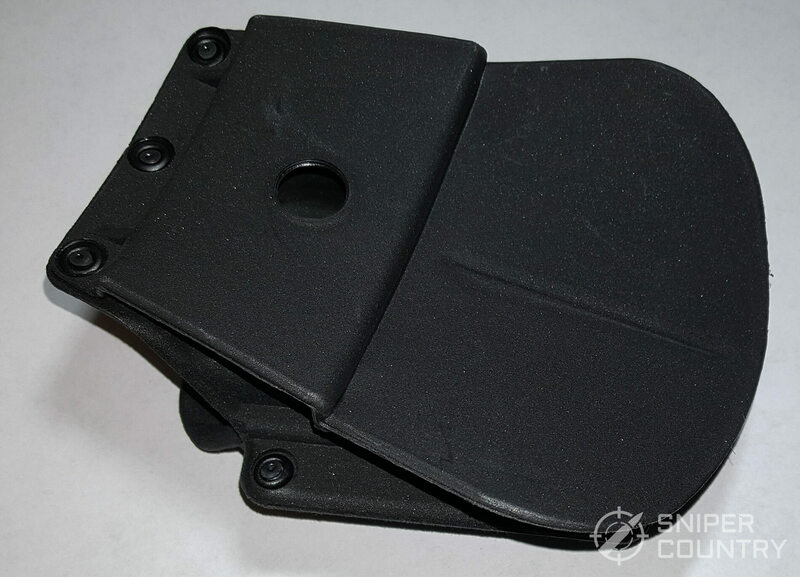 It is made of .080 thick kydex, which helps keep the gun/holster combo very narrow and aids in concealment. 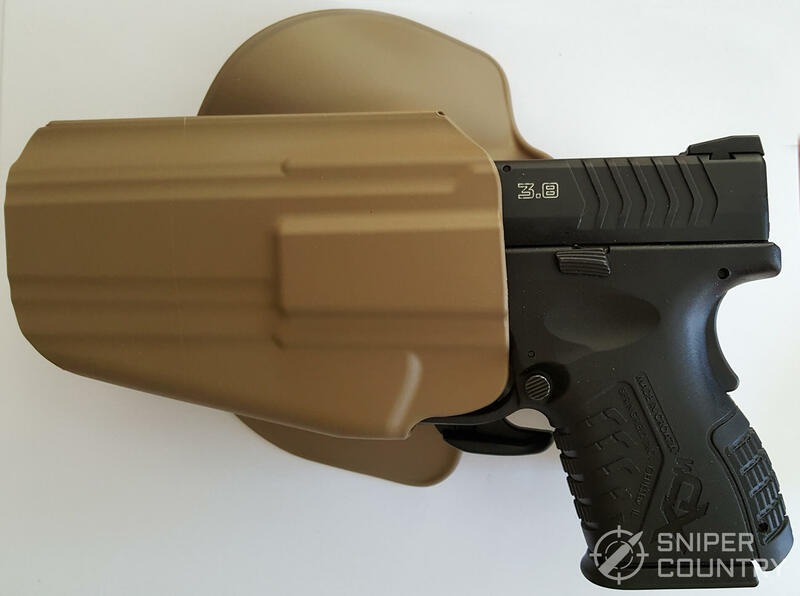 One modification that immediately grabbed me on the web page that describes this gun is the availability of specialized belt clips, called “paddle attachments.”. You replace the original belt loops with these. 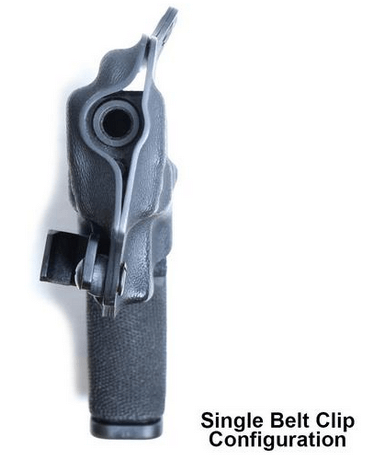 They make it a bit easier and quicker to put the holster on and to take off your belt, as allow the holster to function like a traditional paddle holster. They are listed on the website for about 20 bucks for the pair. I would like this arrangement – I like paddle holsters. They are basically two “wings” that you stick between your pants/belt and your T-shirt that have a positive ledge that grabs your belt and anchors the holster like any other paddle design. 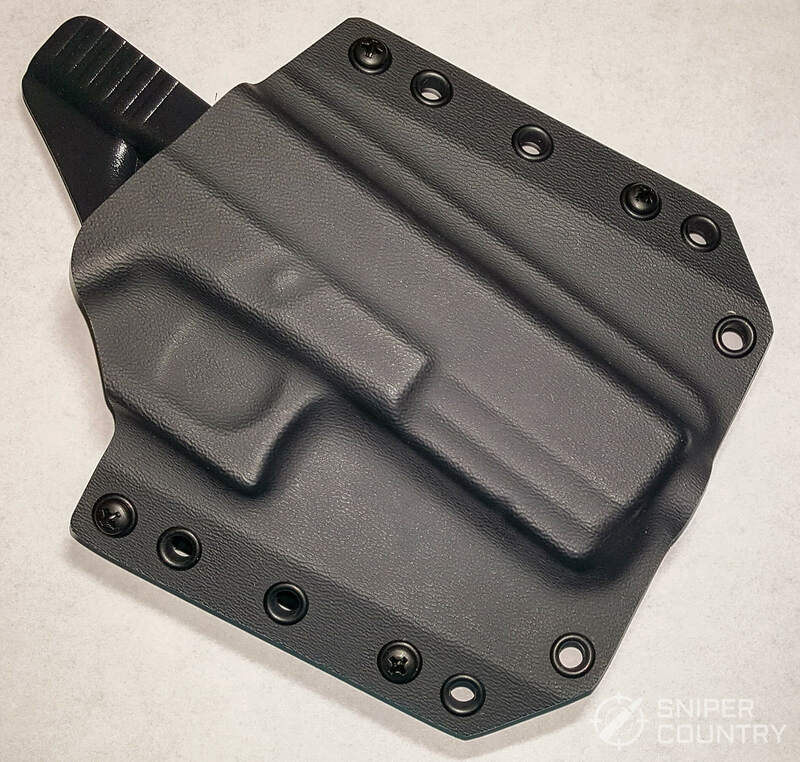 The holster body is molded from black .080-thick kydex and uses black hardware and clips. The holster is molded precisely to fit the Glock 17-it “snaps” in smartly and stays put. 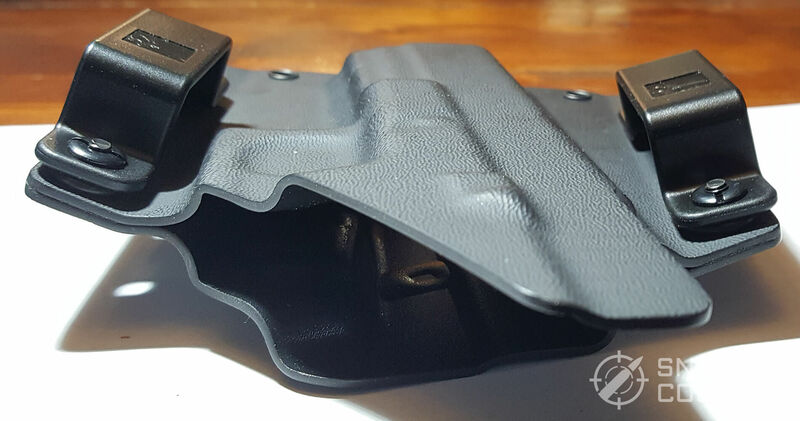 Using .080-thick kydex means that the holster doesn’t add much width to the gun, making it easier to conceal. (To be fair, most other makers listed here also use .080 kydex-it has become sort of a standard width for holsters). 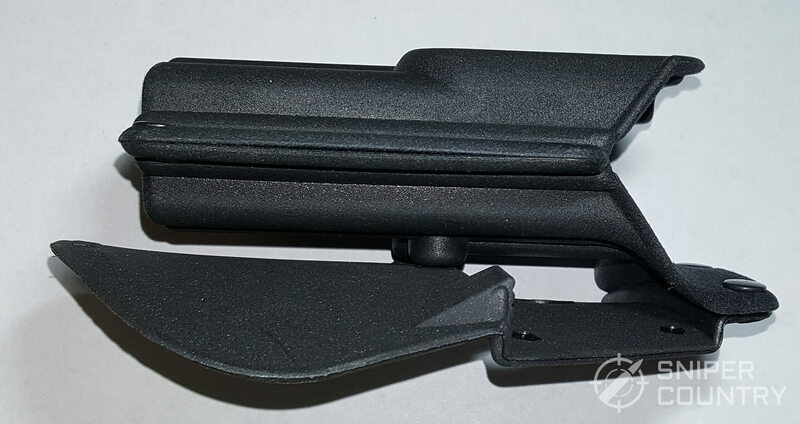 The holster’s outside is a pleasing dark gray color, with a softer touch than plain kydex. The inside of the holster is shiny black. 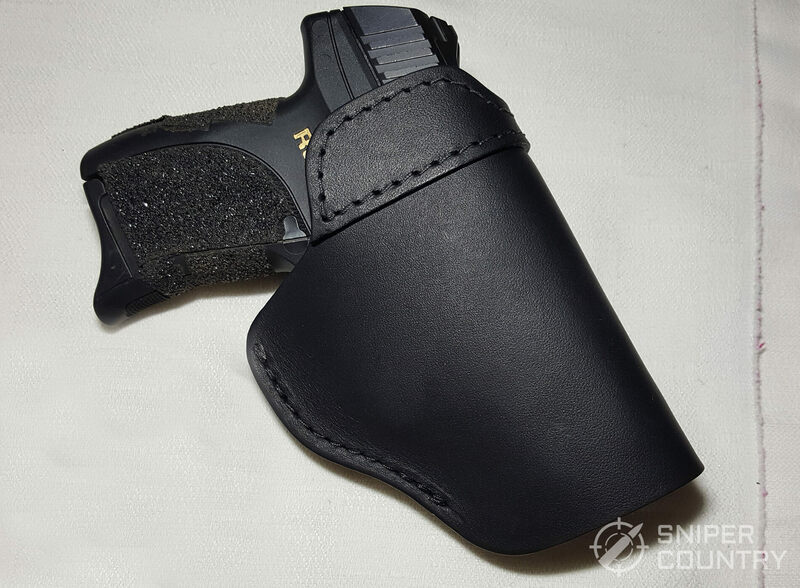 It looks like they might have molded a separate protective film to the outside of the holster in order to help guard the holster from the elements and UV exposure. I understand that some molded parts made for the automotive industry use this same type of film, but I haven’t seen it much on holsters. It is a matte gray in color and contrasts nicely with the interior molding. I am by far no such expert on such things, but this is my best guess after talking with people who work in the thermo-molded plastics industry and showing them the holster. I tried to contact the company to ask about it but was unsuccessful. The Bravo Concealment holsters seem to be the only ones I looked at with this type of construction, at least to my eye. With its slightly softer, less-slick touch on the outside of the holster, this type of construction sets it apart from the other plain black ones. 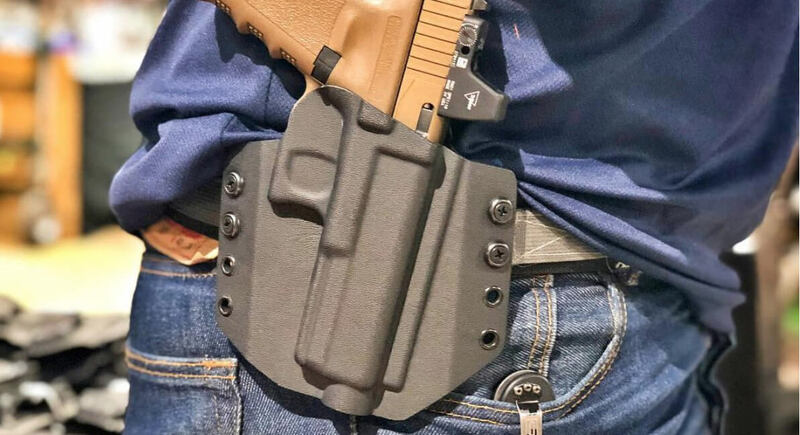 With this being an exterior holster (OWB), I would think that any extra protection they could give to it that might allow it to be used for many years would be well-received by the holsters’ owner. This holster is not going to come apart, to be sure. I count eight rivets and four screws. The metal hardware is as described above for the IWB Bravo Concealment holster – rivets are large and heavy duty. The screws are Phillips-head on the outside and go into slot-head holding nuts on the back so if you want to move the loops, you don’t need to track down a hex wrench or other tool – two screwdrivers will do it. It does not have a retention-adjustment screw, since it really doesn’t need one. The trigger guard friction-fit Level 1 retention is plenty enough to keep the gun securely anchored until needed. (Watch the video…the company owner turns the gun/holster over and gives it a shake – the gun stays put). Speaking of belt loops, you can move them in order to adjust the cant, or tilt, of the holster. I like a pretty pronounced forward cant with my holsters as that aids in hiding the gun’s grip. The grip is the hardest part of a gun to conceal, so (with me, at least), the further forward it is that still allows a full-hand-on-grip draw, the better. With this holster, both loops are in their highest position. You could move either of them (or both, if you just want the holster to ride higher with the same cant) one notch down as there is one unused hole below each loop. 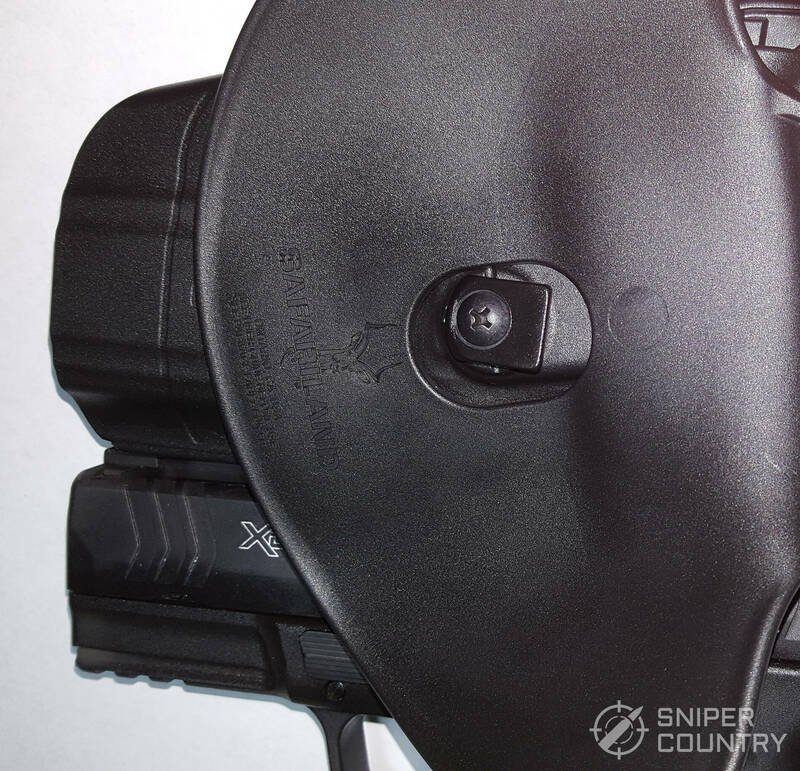 With the loops in their as-shipped position, the holster shows about a 10-degree tilt. If you moved the front loop down, you will lessen the cant. Move the rear loop down in order to increase it. As I said earlier, it’s easily done with a couple of common screwdrivers. Even if you buy the paddle attachments, you still have the same adjustability. I’m extremely impressed with how tightly the gun fits in this holster. The molding is excellent. (If you look at the sweat guard, you see slide serrations molded into it). There will be no problems holding the gun securely. 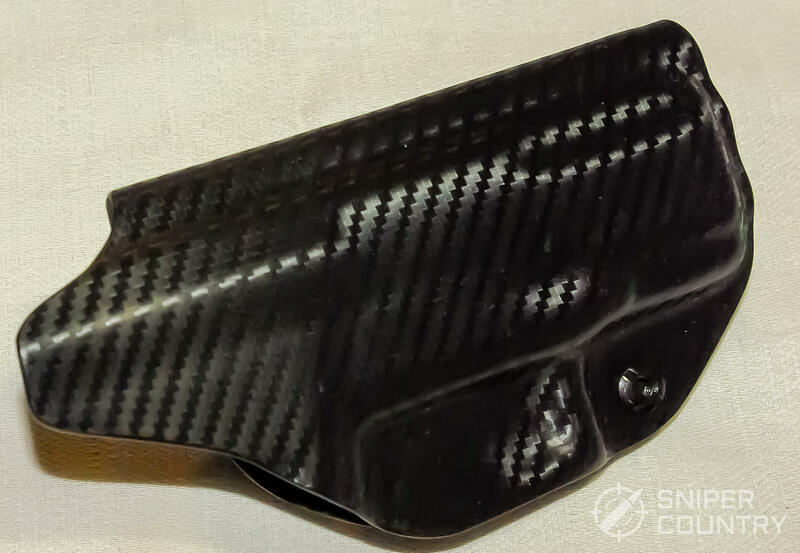 It does have the rounded hole at the bottom that the above IWB Bravo Concealment holster has. 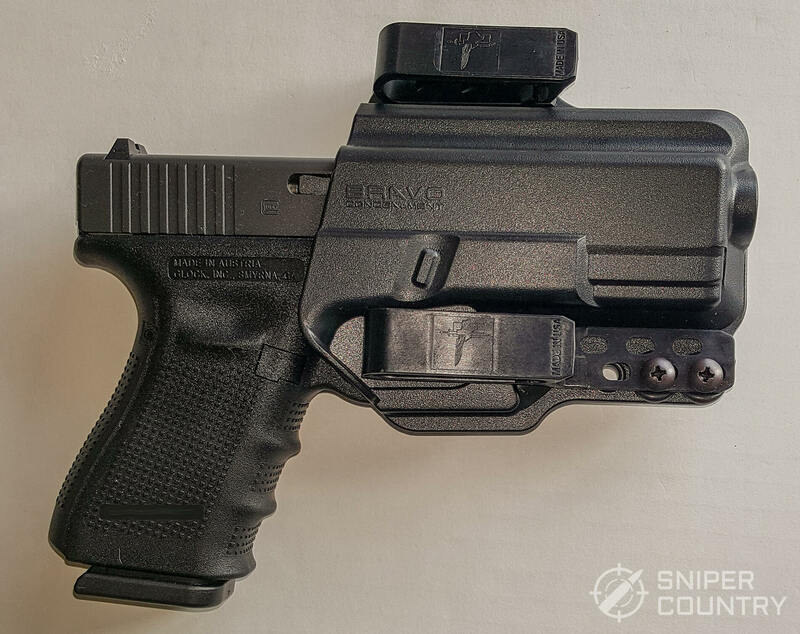 As stated above for the other Bravo Concealment holster, the explanation given by the company for such a round hole is that it allows threaded barrel clearance, which makes sense. It also allows water or debris to fall through the holster without being trapped inside. The debris-clearing function is an added benefit. Try as I might, I couldn’t find anything to complain about with the Bravo Concealment holsters. They seem to be very well-designed, with sharp mold lines and no rough edges. You can tell that they are very finely finished and edge-buffed before they’re shipped off. Their Quality Control must be great. 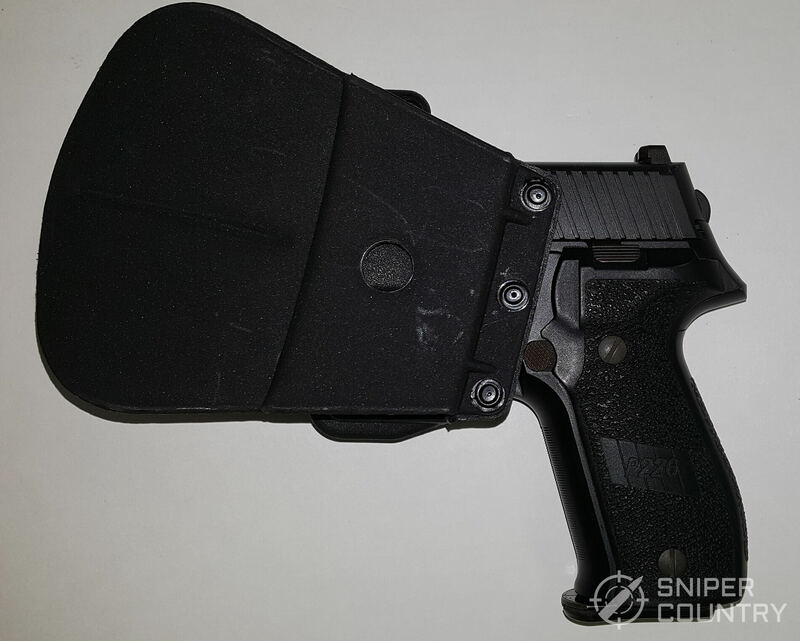 If you are looking for a good OWB kydex holster that’s adjustable, look at this one. Plus, you have the advantage of a 30-day money-back guarantee…that says something about the company. I liked these holsters. Safariland is a company that has made holsters for longer than I can remember, to be sure. This company is known for its law enforcement holsters and also for the sheer variety of holsters it makes. If you want leather, no problem…their reputation was established during the time that leather was THE material of choice for holsters, before the days of synthetic materials. Of course, leather holsters are still preferred by many shooters and Sarailand can accommodate your needs. Safariland make a zillion OWB holsters, so I had to narrow it down. I chose the 578 GLS for two reasons…first, it is a paddle holster (easy on, easy off) and second, it comes in a left-handed version. I got one to fit a Springfield XDM .45, as I have a compact version of that gun. Alas, they don’t make a “shorty” holster for the 3.8-inch barrel of the compact, but they do make one for the 5-inch-plus barrel of the full-size gun. So, my gun fits where it counts – the trigger guard is positively locked by the release lever – and, since it’s an OWB holster, I don’t mind a little more holster than gun on my belt. Worst case, I can always cut it down if I felt it was needed. Here’s a quick word about the way the paddle locks onto your belt, from the inside. Most paddle holster makers use a little ledge or two that slips under your belt and holds the holster in place. This one is different – the photo shows one clip, held in place by a screw. The advantage of this system is that, if for some reason the clip loosens, you can tighten it back down or just replace it. A nice piece of engineering. Another thing that got my attention was that, if you don’t like the belt “loops” that they include, there’s a whole computer screen full of other variations that you can get. Not too many concealed carry holsters go to that level, as most makers consider friction and molded trigger guards enough to keep a gun in place. This holster is definitely a candidate for concealed carry (especially in the winter, when coats cover the gun) and also for backyard or informal wear around my property. Another use that I see for this holster is for those folks who want a definite “lock” on the trigger guard. That group could include police units…there are several duty holsters that use Level 2 retention. How do you draw your gun, given the locking lever’s prominence? Simple. As you slide your hand down to grip the gun, your second finger slides along the lever and pushes it down, which frees the trigger guard and allows the gun to be drawn. Safariland evidently thought of that. If you’ll look closely in the photo, you’ll see a line scribed into the polymer. It just so happens that that line corresponds with the end of the barrel of my compact. I will, before it’s said and done, cut the holster and polish the edge to fit my gun. That way, I won’t have so much empty holster hanging down. 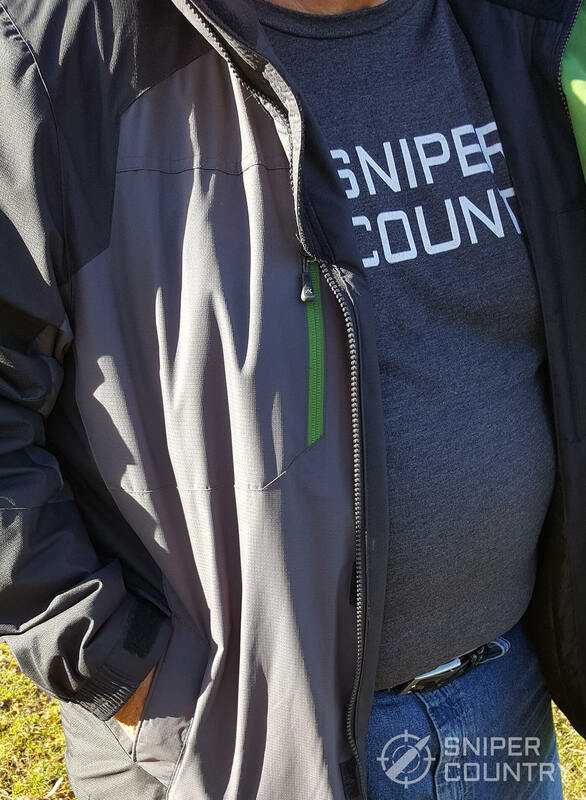 Here are a couple of shots of me wearing the holster…granted, there is more of me in front than there needs to be but you’ll get the idea. After I shorten the holster, it’ll be a little handier. Do I like the holster? Yup. Was I a bit leery of the single “hook” that catches your belt instead of a more-standard ledge? Yup. But…after wearing this thing and then trying to get it off, you just about need to remove your pants to get the hook loose. It’s the most secure paddle I’ve ever worn. This holster lists for $58, but you can find it for less on Amazon. Just make sure that they make a version for your exact gun. You can call them at 800-347-1200. This holster is a gem. I got one to fit a Sig 320, a very popular carry gun and its fits it exactly (I know, that’s not a Sig P320 in the photo, but the holster fits more than one gun model). The holster shows excellent workmanship and molding technique. The edges are all finished and the hardware seems to be overly-strong, especially the rivets. This holster doesn’t use as many rivets or screws as some of the other holsters we’ve looked at, but sometimes that’s a good thing. I count only three rivets plus the retention screw holding the holster halves together, with three more securing the paddle to the holster body. After handling this holster for photographs, I am sure that it will last as long as it is needed. 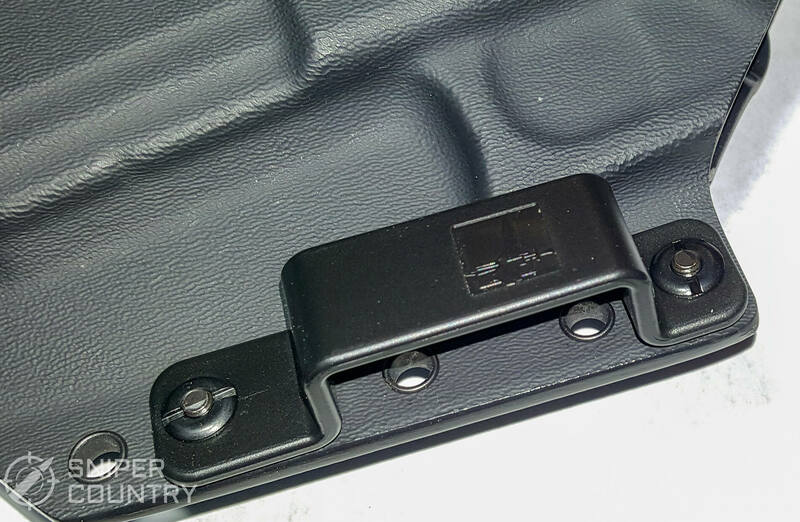 After reading about the holster on their website, I confirmed what I had thought when I looked down inside the holster – the inside is suede-lined. 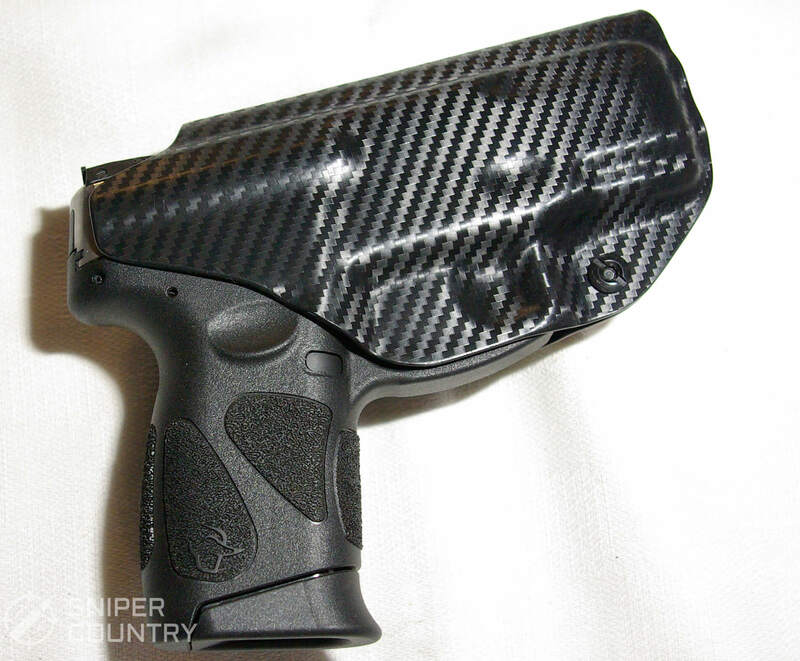 Now, here is a holster that will pamper your pistol. You don’t have to worry about scratching the gun’s finish as it slides in and out of the holster. This is a really good idea – I’m surprised more holster makers don’t do this. 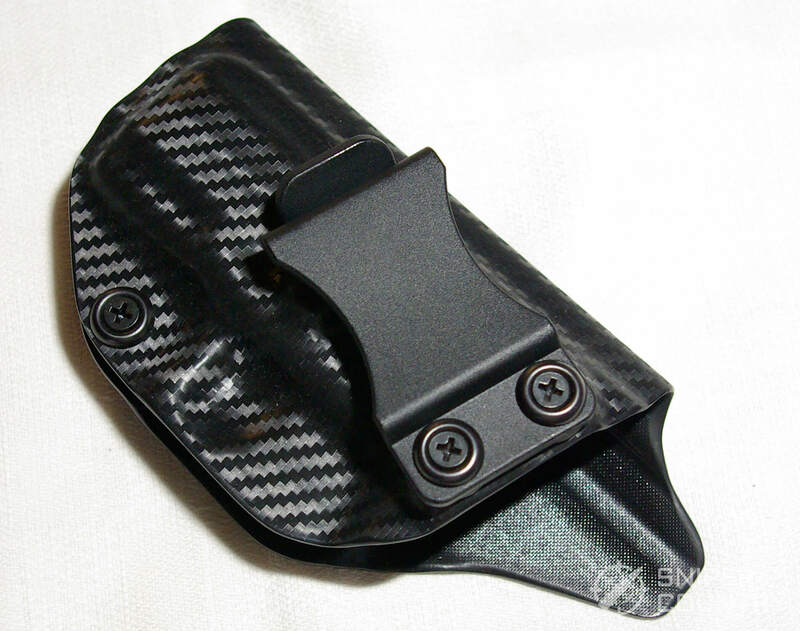 Like most other holsters in its class, this paddle holster has an adjustable retention screw. You can loosen it if your gun won’t go in without a big push, or you can tighten it to make sure your gun stays put. Between the holster halves lies the rubber washer that cushions the halves at the retention screw mount. Again, this is fairly standard for these types of holsters but not all holster makers include a retention screw on their OWB holsters. It’s your call whether or not this is an issue…all the holsters I examined did a great job of keeping the gun secured. Speaking of that, this holster uses Level One retention, with friction keeping the gun in place. 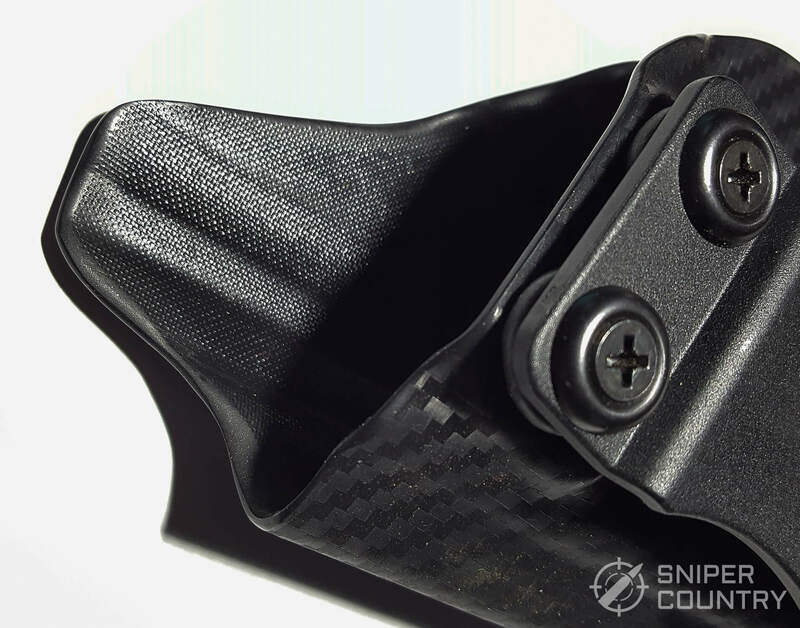 The trigger guard area has been shaped to allow the gun to “snap” into the holster with a positive click, as the gun’s trigger guard enters that part of the holster designed and molded to hold it tightly. The paddle that allows this holster to be put on or taken off your belt/pants without removing your belt (as you would have to do with belt loops) is very large. You can see how big it is in the photos, and that its curvature is pronounced. As a person who has worn many paddle holsters, I can tell you that I like both of these features. The large paddle means that the holster will stay exactly where you put it and not dig into your leg or hip like smaller paddles tend to do – believe me on that one. Its curved nature means that it will adapt to your side as you wear it. 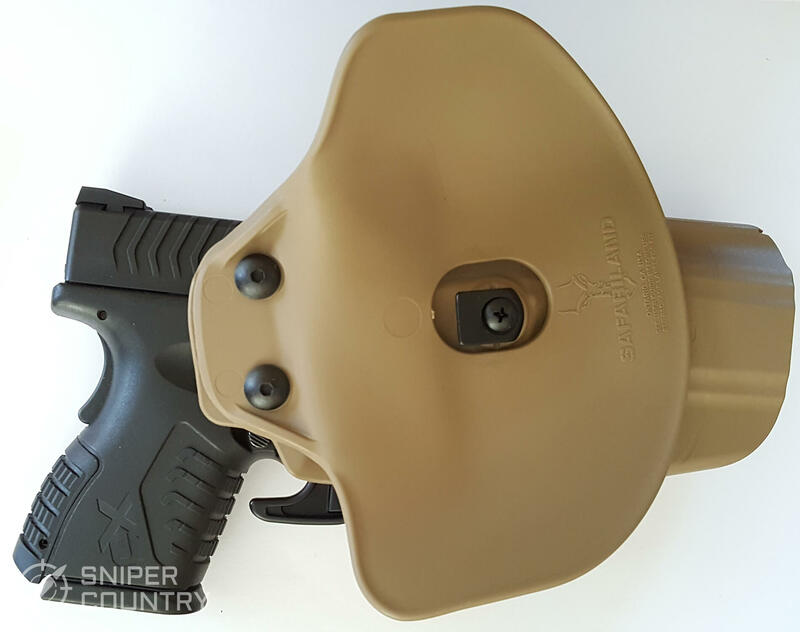 There are some paddle holsters that use a ventilated paddle that is almost too pliable and bends fairly easily. In my experience, this is not good. The large, curved paddle on this holster will not flex very much, if at all. This one should anchor the holster very well on your belt. And, speaking of anchoring the holster, I took a photo of the top of the “ledge”, that part of the paddle that is supposed to snap below your belt and hold the holster in place as you draw the gun. I’d never before seen, on any of the paddle holsters I have now or have owned, little parallel lines or ridges molded into that belt-gripping surface like we have here. This is truly not a big deal, but it just goes to show that this maker pays attention to the smallest details. With these lines or ridges, the paddle can’t slip as easily as you draw the gun as it might if the surfaces were smooth. 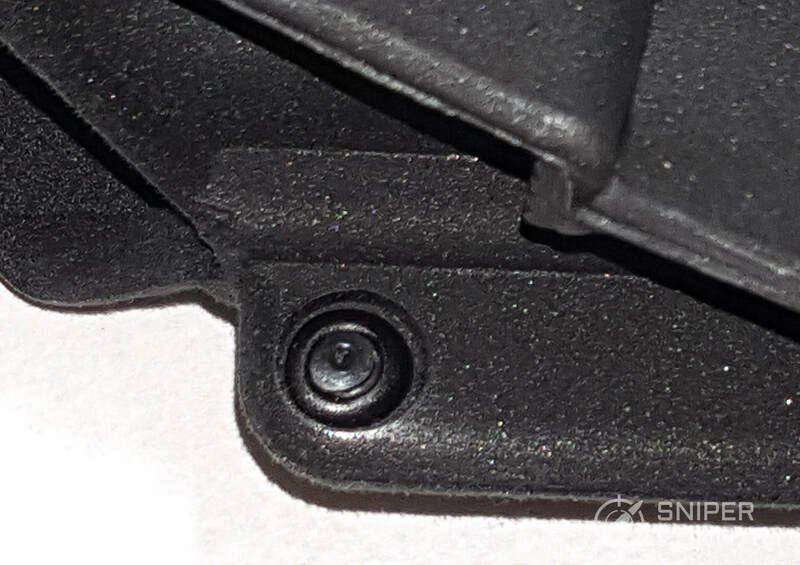 Again, a tiny detail but one that shows this company knows about holsters. This is a well-made holster. I would not hesitate to carry it, if they made it in a left-handed version which they don’t. Regardless, the holster seems very up to the task of protecting your gun as you go about your day (or night). According to the website, this holster’s target market is law enforcement/tactical/military personnel. I could see that, if the powers that be would allow its forces to carry a Level One retention holster. Where it shines is its application for the rest of us – the citizen concealed carriers out there. If you’re looking for an OWB holster for your semiauto, check the website to see if there is one made for your gun. (They make eight different sizes that fit many guns). I don’t think you’d be unhappy with it, especially since it only costs $24 tax free (according to their website). Now, we will look at ankle holsters. Why ankle holsters? Some people wear them regularly and like them a lot. With an ankle holster, you don’t have to worry about your gun “printing”, as you wear it on your belt in some fashion. Unless you like the stiletto-style pants legs (we called them “pegged” in the 1960s), your gun would remain well-hidden in an ankle holster. As I mentioned above, there are two main types of ankle holsters – those that do not have an extra strap and cuff around your calf, above the holster, and those that do. The AKH holster does have that security strap and cuff. 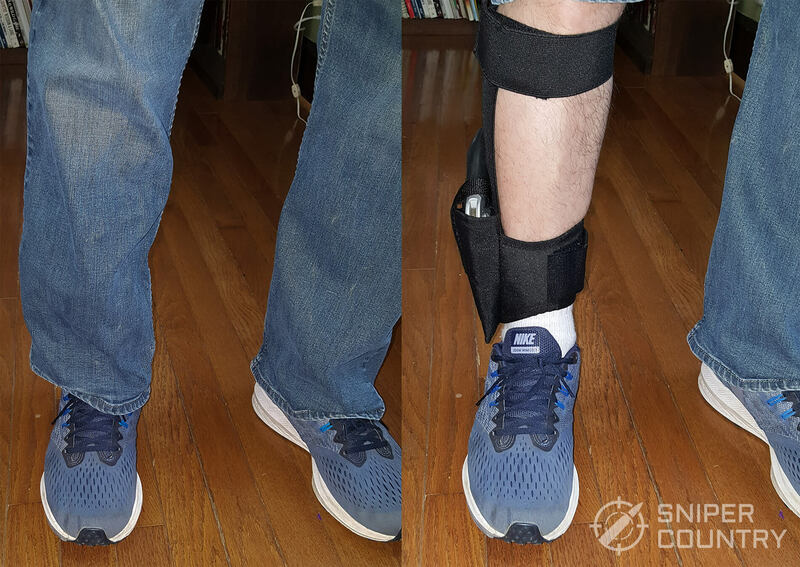 You have not only a fairly decent-sized main band around your ankle that the holster is secured to, but also an elastic band connected to a vertical strip that securely fastens around your calf. This helps hold the holster in place as you go about your day. I would imagine that you could chase somebody down the street and have this ankle holster stay in place. What Can Go Wrong With An Ankle Holster? The problem with some ankle holsters is that they don’t have that extra security strap that goes up around your calf. 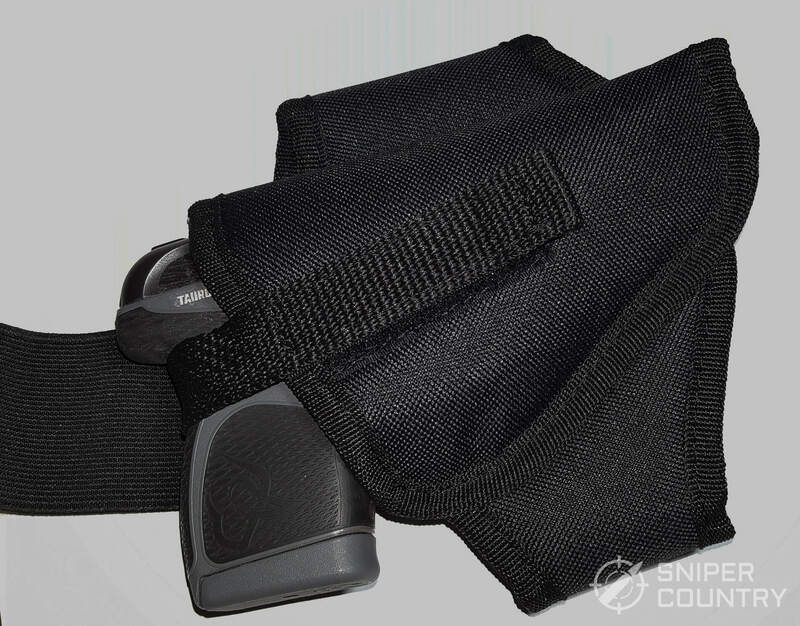 All they have is the main holster body that fastens around your ankle with a Velcro or other type fastener. If you have to chase somebody, the holster may very well end up on the top of your foot because it slid down. That’s an issue with some cheaper ankle rigs that are just the main body with no higher-level security strap. Another problem that could occur is that the holster could rotate on your ankle, putting the gun’s grip out of position for a quick draw. Unless the holster is very tightly attached to your ankle, this rotation is a possibility. With a second security strap holding the holster in place, this shouldn’t be an issue. This holster has such a strap. Going from the description of what this holster fits on their website, I got a holster for a S&W J-frame or Ruger LCR snub-nose revolver so I could try it out with my Model 638 J-frame. But… in the photos you’ll see my Taurus Spectrum .380 strapped into the holster. How is this possible? It fits because the holster is made of a nylon blend and is very adaptable to different gun shapes. I could easily see someone buying this holster to fit more than one gun. 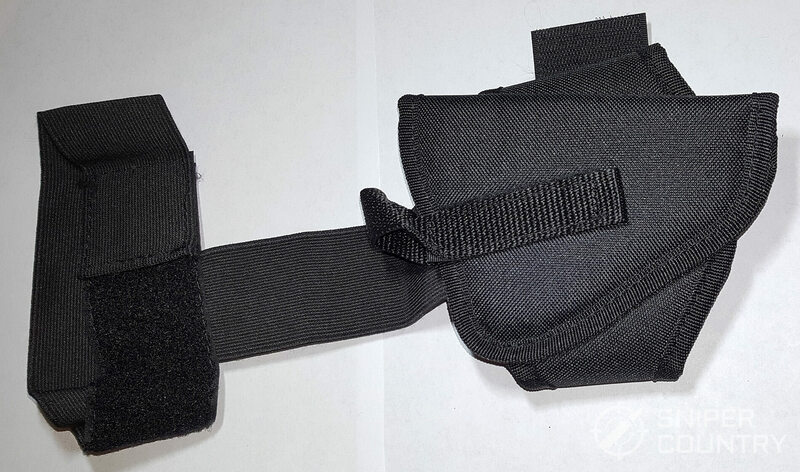 The retaining strap is long, with a lot of Velcro so it should hold any gun that will fit in the holster. The photos above are taken with a holstered revolver and the following is with a Taurus Spectrum. That’s an advantage of some lesser-expensive holsters. I’m talking about the nylon OWB holsters that have an attached magazine pouch and are designed for “4-inch revolvers”, for example. More than one gun will fit it. The inexpensive nylon holster may not be solidly attached to your belt, but it has a few movable straps/thumb snaps/etc. that you can move around to hold whatever you put in it. The belt clip can be moved to the other side, which makes the holster ambidextrous. 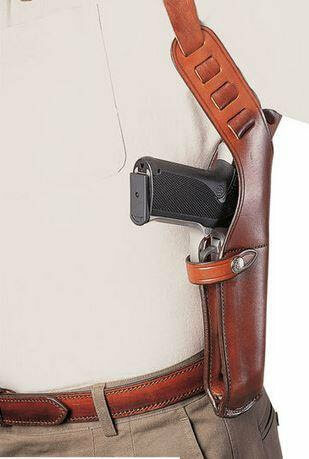 (Most holsters of this type include not only a belt clip but a belt loop, as well). I’m sure you’ve seen these holsters, or may even own a few as I do. Why do I mention, in some detail, these nylon-based holsters? The AKH ankle holster works much the same way, in that it will accept more than one gun and is very pliable. 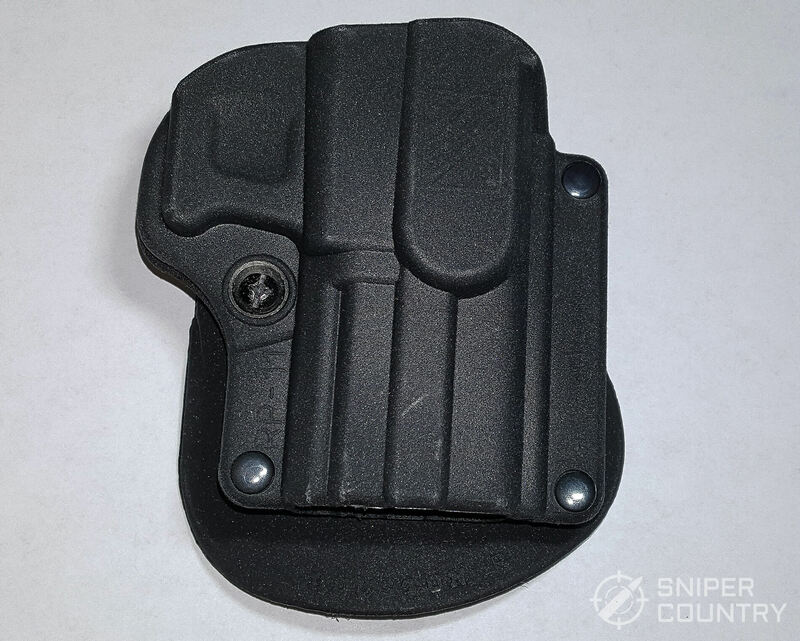 A major exception between this holster and the generic ones mentioned above is that it is very firmly attached to the leg band and cannot come loose, unless it is literally cut or ripped off its mounting cuff. The advantage, as I’m taking the long way around to say, is that more than one gun will fit it so if you are looking for a rather unconventional way to carry a couple of different backup (or main) guns, give this ankle holster a look. I am impressed with the Houston Gun Holster company. Located in Ft. Lauderdale, Florida, the company prides itself on providing the shooter with top-quality equipment, whether civilian or tactical team member. Their prices are very reasonable…couple that with some seriously well-built holsters and you have a winning combination. The X-15 holster is something of a legend. I remember back in the early 1980s seeing this holster advertised in gun magazines and wishing I could afford one. 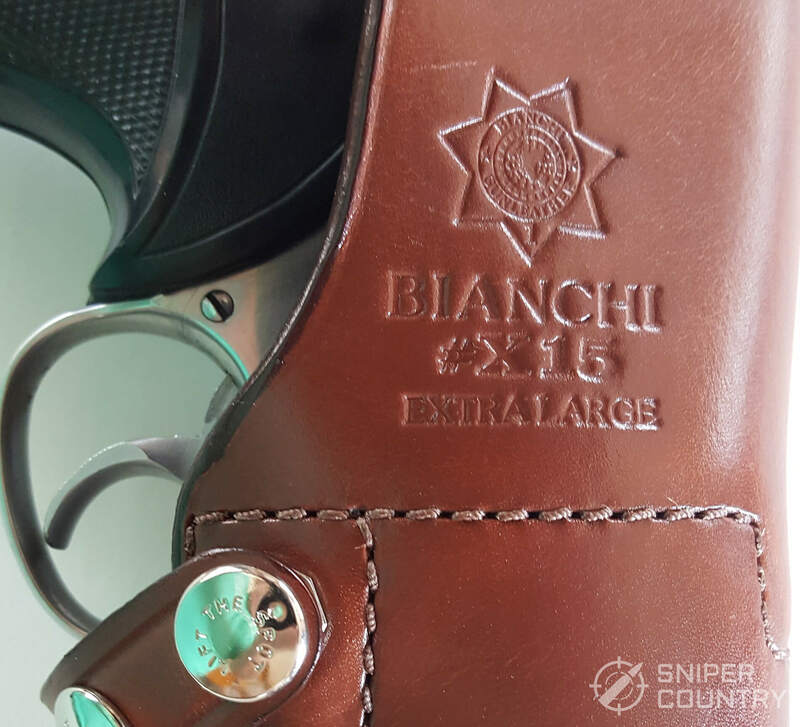 It is not inexpensive, but you do get what you pay for, Bianchi holsters are known for their quality and value for the dollar. Many police agencies use their duty holsters and have for many years, and their X-15 shoulder holster has been part of that collection. Why in the world would anybody in their right mind want to carry, concealed no less, an 8 3/8″-barreled S&W Model 629 .44 Magnum? Well, I think the most common answer to that is “because you can”. This holster makes it easy to hide a pretty large hand cannon. I see it more as a hunting holster, but I’m sure there are those out there who would carry this just to say they did. Heaven forbid you’d ever have to use this in a defensive situation, but the look on the bad guy’s face would be priceless, I’m sure. 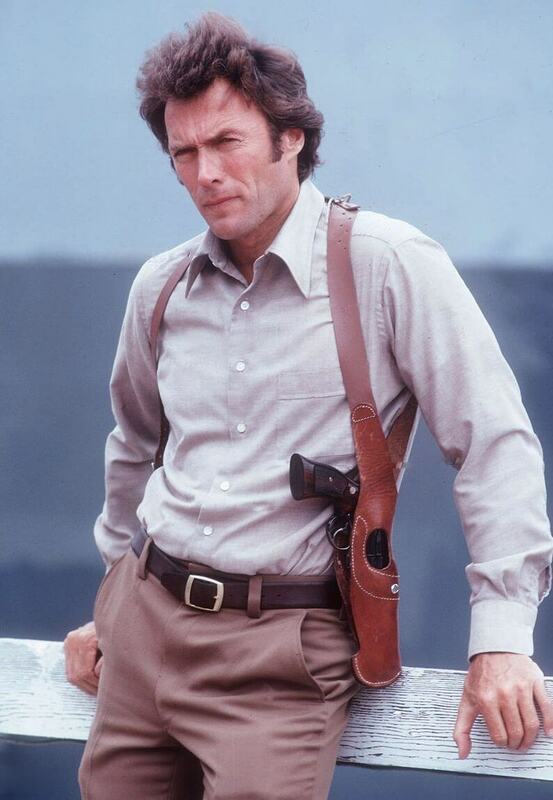 We’ve all seen the “Dirty Harry” movies, with Clint Eastwood’s character pulling a 6″ Model 29 from a similar holster from under his suit jacket. This just takes it a step further. As you can see, this is one heck of a holster. I don’t think you can do any better if you’re looking for a vertical shoulder holster than the X-15. 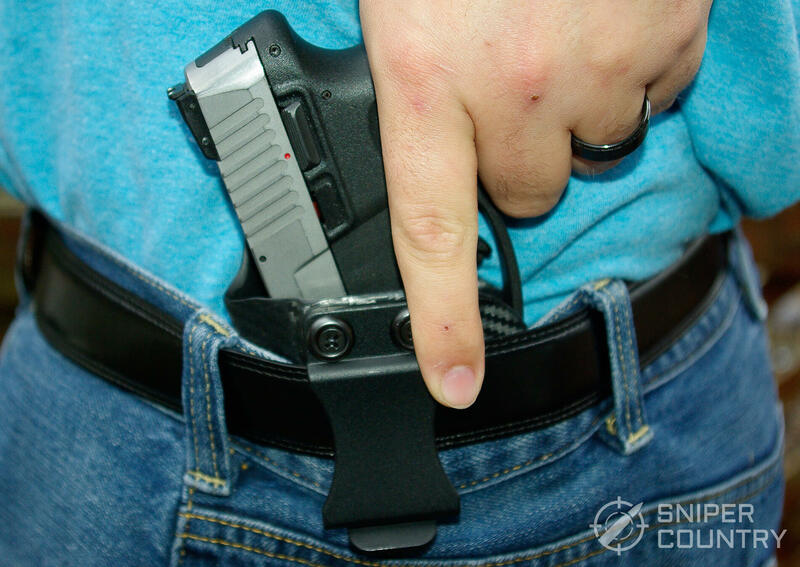 We have looked at 11 concealed carry holsters. Out of hundreds of CCW holsters available for sale, I have tried to narrow it down and write about a few holsters that I believe are some of the best out there for their intended purpose. That purpose would be the safe transportation of a hidden gun on your person that allows instant access in the case of immediate need. We have seen holsters for your belt (either inside or outside your waistband) and an ankle holster, as these are the most common types of holsters sold for concealed weapons. Why am I re-stating the obvious? 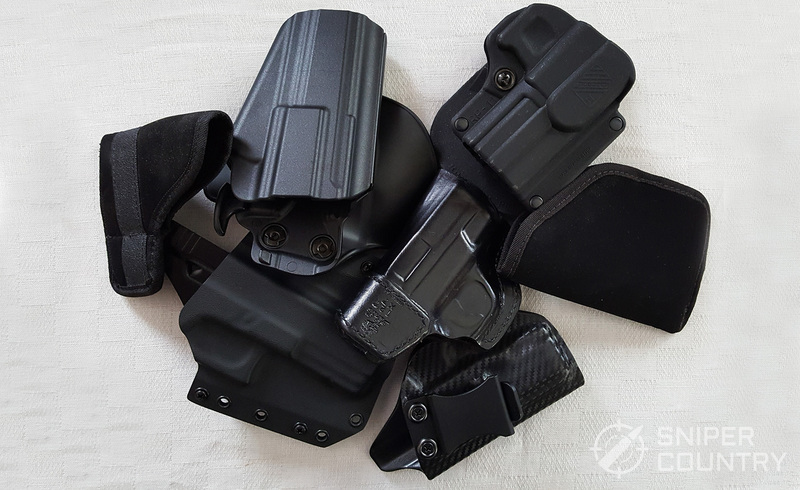 I am simply reiterating that there are many different types and styles of holsters out there that will work for concealed carry but I wanted to hopefully give you at least a place to start in your search with these few that I’ve discussed. 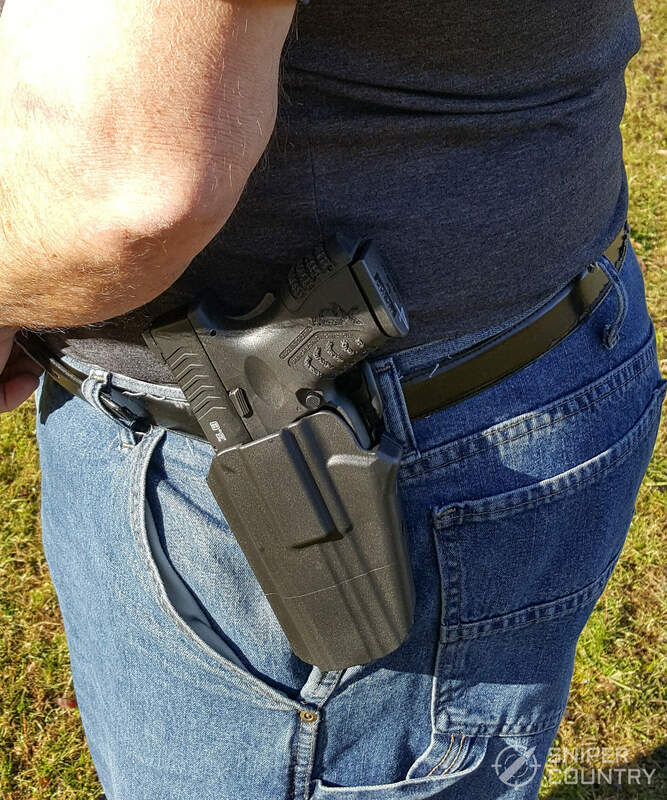 I know that I have personally found one new favorite IWB holster from those I tested – I’m wearing it as I write this. It is, like all that we’ve talked about here, comfortable to wear and really holds the gun in place. I have a whole drawer full of holsters that already work yet I found a new favorite one in this collection. If I could do that, maybe you can, too. The nice part about most of these holsters is that they are not expensive – you can afford to get a couple of them and decide which is best. You are also at liberty to take advantage of at least one company’s 30-day money-back guarantee. That’s a pretty good deal. We’ve never, at any time that I can remember, had so many quality, affordable concealed carry holsters available to us. I’d like to hear about your experiences with CCW holsters or with any of the companies mentioned. Please feel free to leave a comment below. Thanks for these reviews, always well done. I’m certain the testing then documentation/presentation takes a lot of time and effort. It’s appreciated. Thanks for the kind words, Paul. It is demanding, testing like I do, but that’s the only way to really wring out the products. I appreciate your comments. Thanks for the article. I learned a few things. I found Clinger Holsters to be exceptionally well made and extremely versatile, comfortable and effective. Tom, I agree…they’re great. I just had to limit it so as not to have way too many. Sometimes, that’s worse than not enough. They do make great stuff, for sure. Thanks for your comment! Great review as usual Mike. Keep up the good work mate it is well appreciated. Thanks for the kind words, Matteo…I appreciate your comment! Hi nice article, I have a Galco Stow and Go for my Taurus 605 revolver and it is similar to the suede IWB in this article. I carry it 1:00 appendix, even when I’m on my bicycle. It is more expensive but has a wider clip. lan, Galco makes very popular holsters. Glad you can carry while biking…I used to have a dog problem when biking and a gun would’ve been comforting. Thanks for the comment!